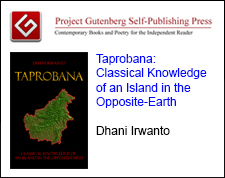 This book presents the latest research about the Taprobana – a historical name for an island of the Antichthones (“opposite-world”), in the Eastern Sea, described by some Roman classic writers. 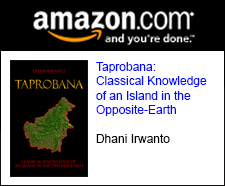 After gathering abundance evidence, the author finally proofs that Taprobana is actually the Kalimantan Island (English: Borneo). Read or download book: Google Books, Google Play, Gutenberg. The paperback is available at Amazon. 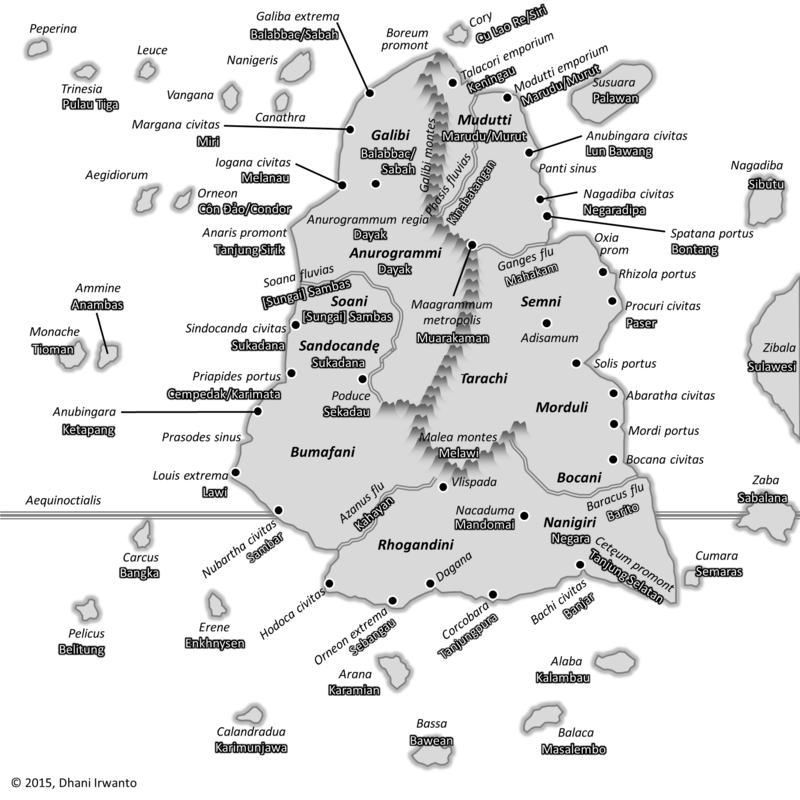 Taprobana (Ancient Greek: Ταπροβανᾶ) or Taprobane (Ταπροβανῆ) was the historical name for an island in the Indian Ocean. 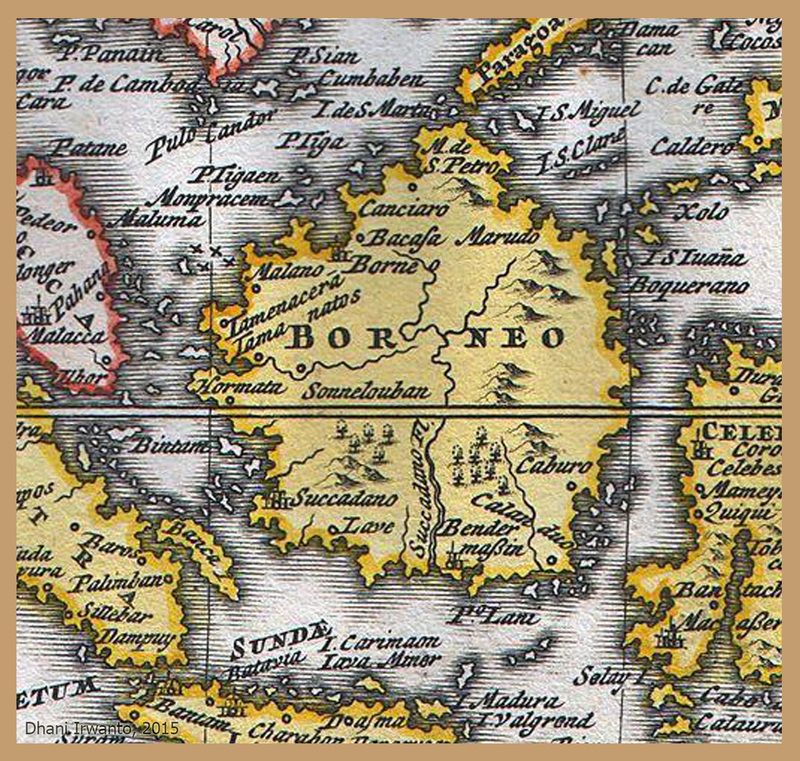 Onesicritus (ca 360 BC – ca 290 BC) was the first author that mentioned the island of Taprobana. The name was also reported to Europeans by the Greek geographer Megasthenes around 290 BC, and was later adopted by Ptolemy in his own geographical treatise to identify a relatively large island south of continental Asia. 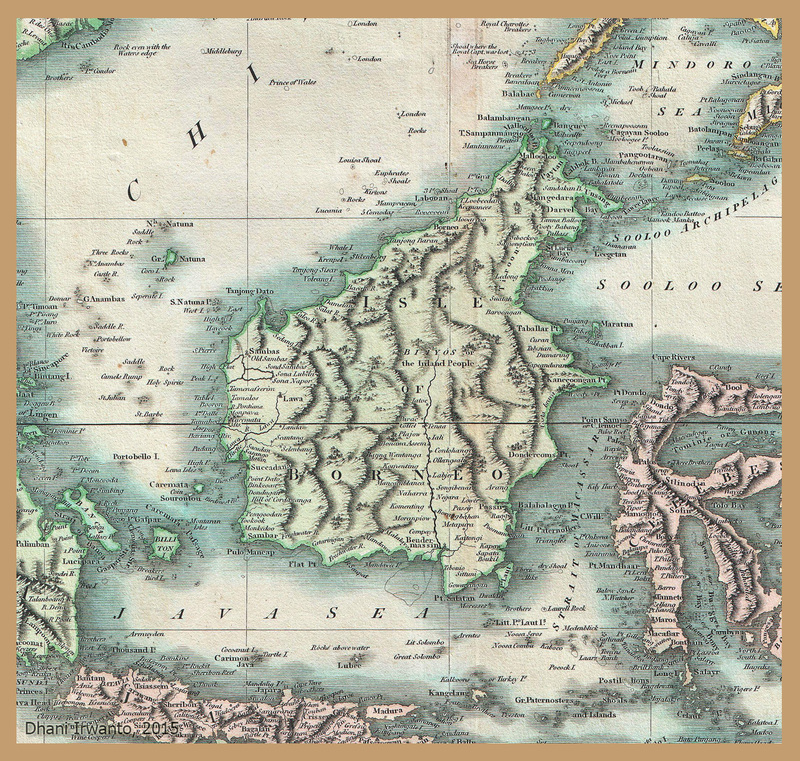 Though the exact place to which the name referred remains uncertain, some scholars consider it to be a wild misinterpretation of any one of several islands, including Sumatera and Sri Lanka. The island entered European consciousness during the conquests of Alexander the Great. Alexander’s admirals Nearchus and Onesicritus described Taprobana in their reports to their king. Nearchus sailed around the southern tip of India, describing the smells of cinnamon that wafted from the fabulous island he passed along the way. Megasthenes, Seleucus’s ambassador to the court of Chandragupta Maurya, fleshed the place out a bit more. Several Roman cartographers and historians wrestled with the size, shape, and position of Taprobana before Claudius Ptolemy described an immense “Taprobana” in his Geographia, written about AD 150, six times the size of the Indian subcontinent and straddling the equator. After the fall of Rome, European geography entered a Dark Age more profound than that of most other disciplines. Like many ancient books and scholarly works, especially those housed at the Library at Alexandria, the work of Ptolemy was lost for over a thousand years in Western scholarship. At the end of the 1400s, after Renaissance scholars studying the writings of the Muslim scholars who had preserved much of the classical knowledge that had been lost to the West, his work was rediscovered and translated into Latin, a more commonly used language of Western scholars at the time. 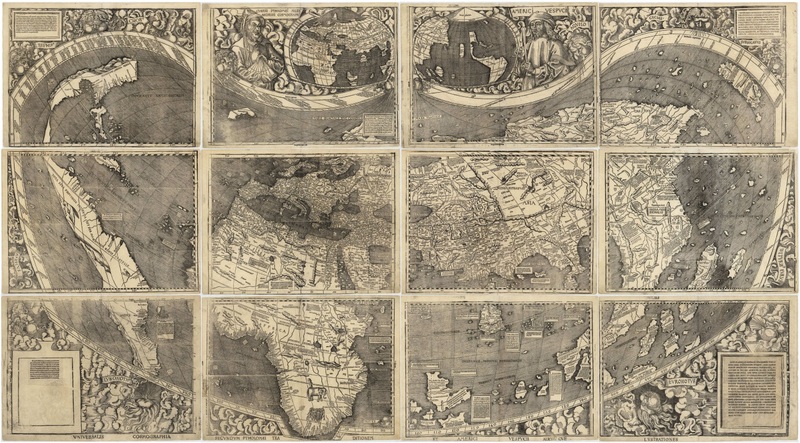 Geographia became popular once again and more than 40 editions were printed. In his work Geographia, Ptolemy described and compiled all knowledge about the world’s geography in the Roman Empire of the 2nd century. A substantial undertaking in scholarship of the day, Geographia was written in eight volumes. The first part discusses the problems of projections, that is, representing spherical item such as the earth on a flat sheet of paper. The second part included seven volumes and was composed entirely of atlas. One problem modern historians have encountered when researching Ptolemy’s work is that his works were all copied by hand and redistributed. Many of his maps were not redrawn when copies were made and most copies known to exist today do not include his drawings; rather, the books include maps made many centuries later based on his descriptions or are missing maps altogether. One such source that points out this problem is an Arabian scholar by the name of al-Mas’udi who wrote around AD 956 that Ptolemy’s Geographia mentioned a colored map with more than 4,530 cities plotted and over 200 mountains. In Ptolemy’s world map he identifies many modern geographic areas including Taprobana and Aurea Chersoneus. This has been the primary subject of debate over Taprobana. Each succeeding generation has read vague descriptions of the island left by their predecessors, and wrangled over what their predecessors really meant. 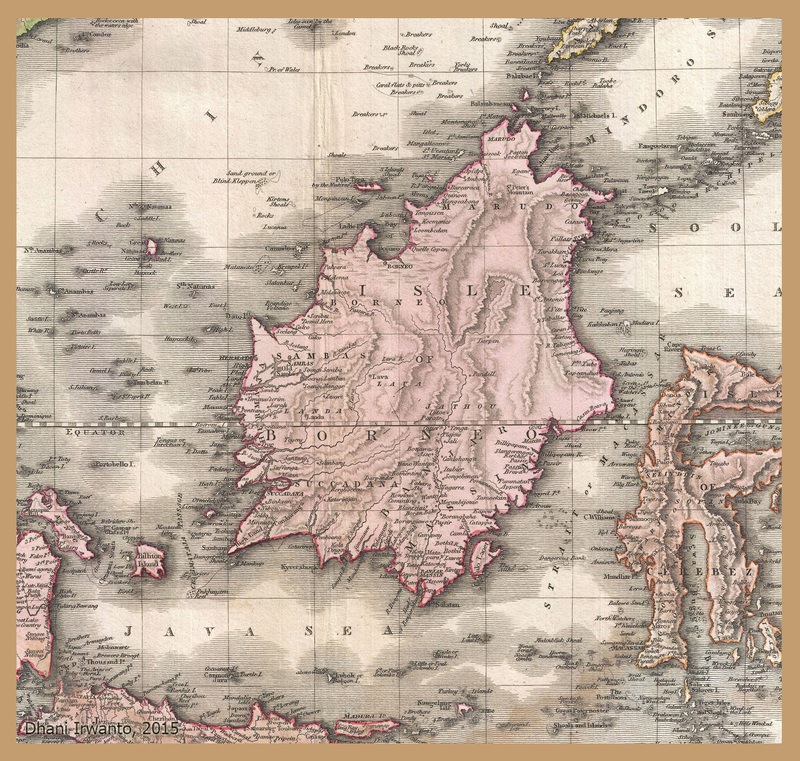 18th and 19th century scholars began to think that Ptolemy confused Sri Lanka with Sumatera, or even the lower peninsula of India. In the end, it is impossible to assign a single place with all of the qualities that have been labeled with the name “Taprobana” over the ages. 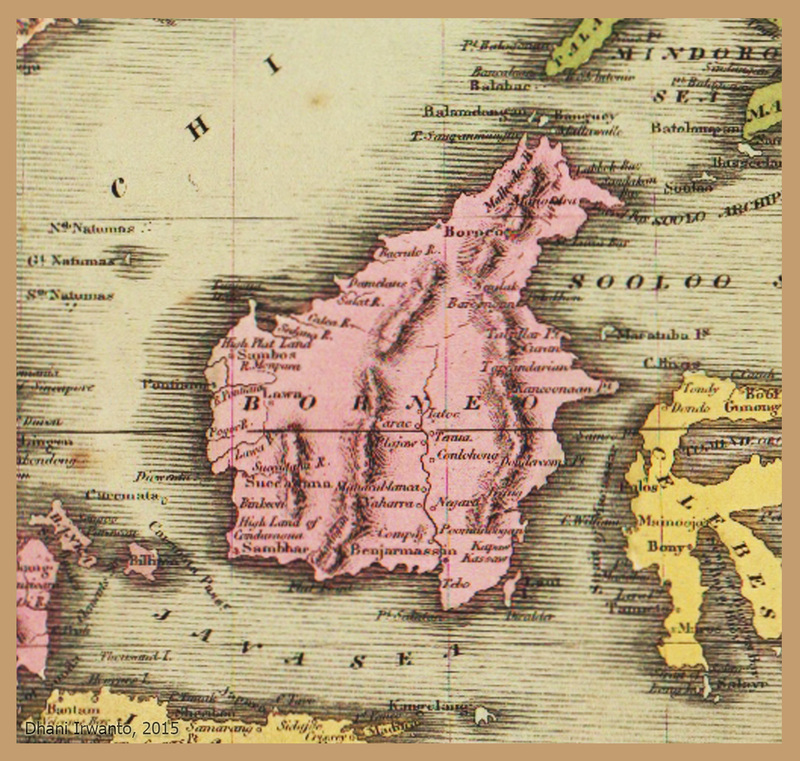 The name Taprobana had been applied to Sumatera from the fifteenth century onwards, after a misunderstanding by the Italian traveller Nicolo di Conti. 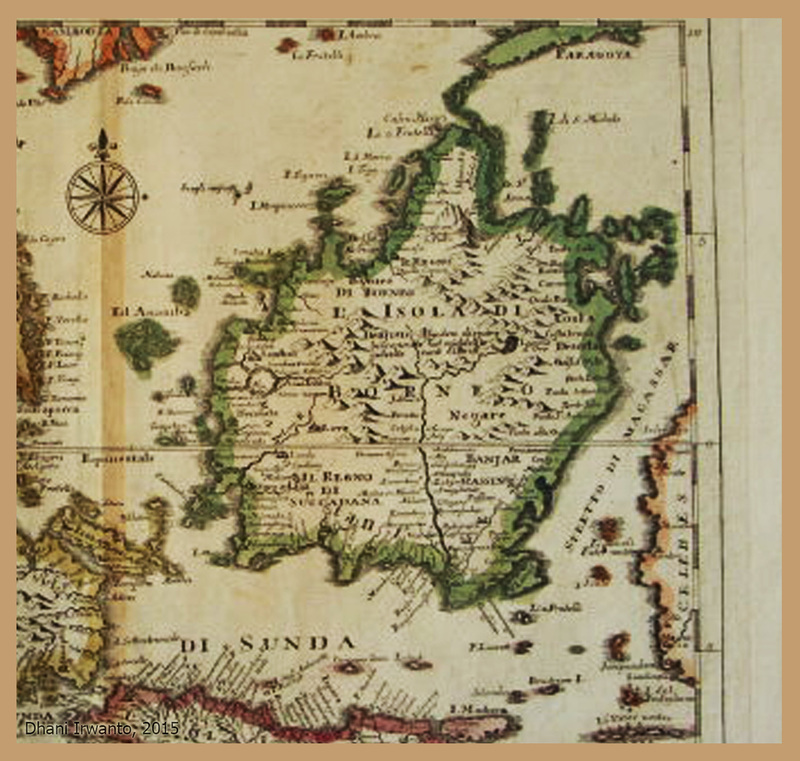 Conti was the first European traveler who distinguished Sri Lanka from Taprobana and identified the latter as Sumatera, which it will be noted, athwart the equator. Subsequent geographers, historians, cosmographers and thinkers alike became engaged in a controversy over its proper identification. Considerable confusion began to exist as to whether Sri Lanka or Sumatera was the island of Taprobana and depicted in the Hereford, Ebstrof, Catalan Atlas’ Mappae Mundi and on Fra Mauro’s Planisphere and Martin Behaim’s Globe. The maps such as “Cantino”, “Caverio” and “Contarini” have misled the contemporary viewers who in their turn transmitted this confusion either through implicitly casual discussions or even deliberately explicit instructions to mapmakers who in their turn propagated it just as naively and with the same degree of intelligence as their informants through the documents they were producing for their immediate users. 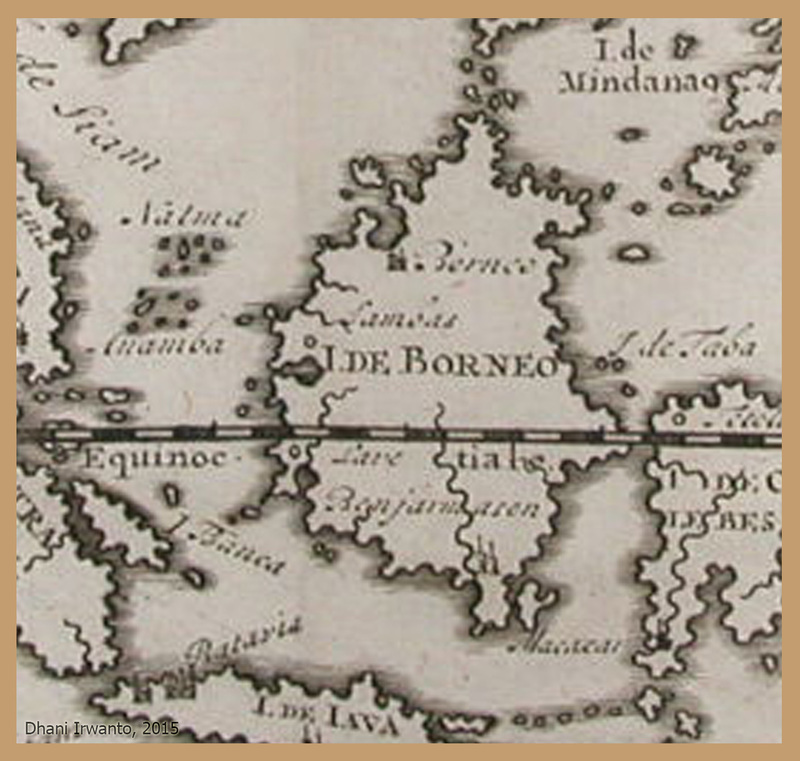 The peculiar geographical vicissitudes of Taprobana drew the attention of leading figures from western history, Ramusio, Gossellin, Kant, and Cassini who concerned with the dilemma, attempted to resolve the question of Taprobana’s identification with countries ranging from Sumatera to Madagascar. 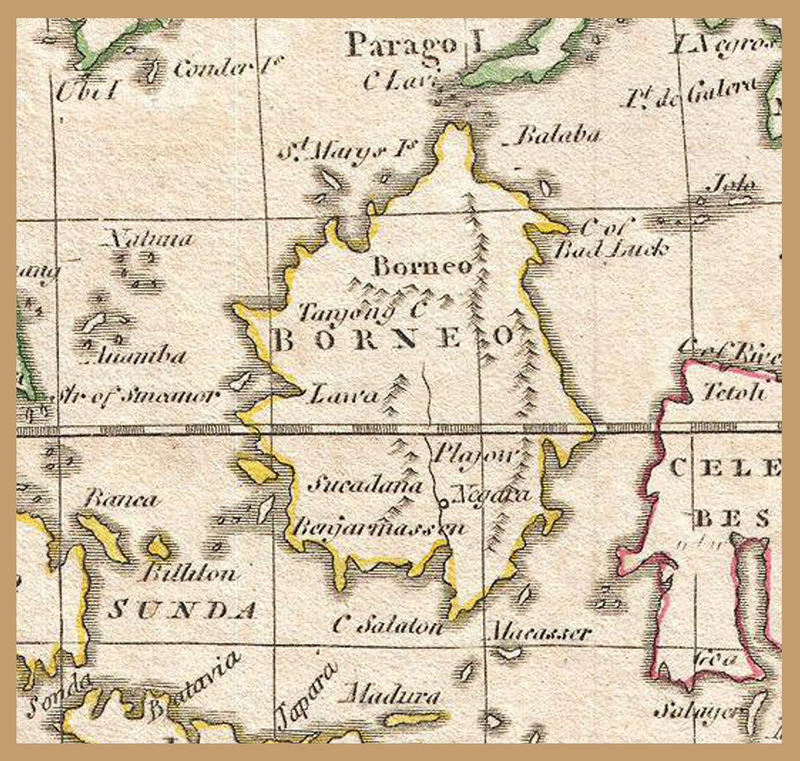 Venetian geographer, historian and humanist Ramusio relying on an account of an anonymous Portuguese and based on geographical and astronomical data sought to reconcile the location and dimensions of Sumatera with the position and size of the island that Iambulus the Greek merchant claimed to have discovered. The aim of his argument thereby was to determine that this island was precisely the Taprobana of the classical authors. 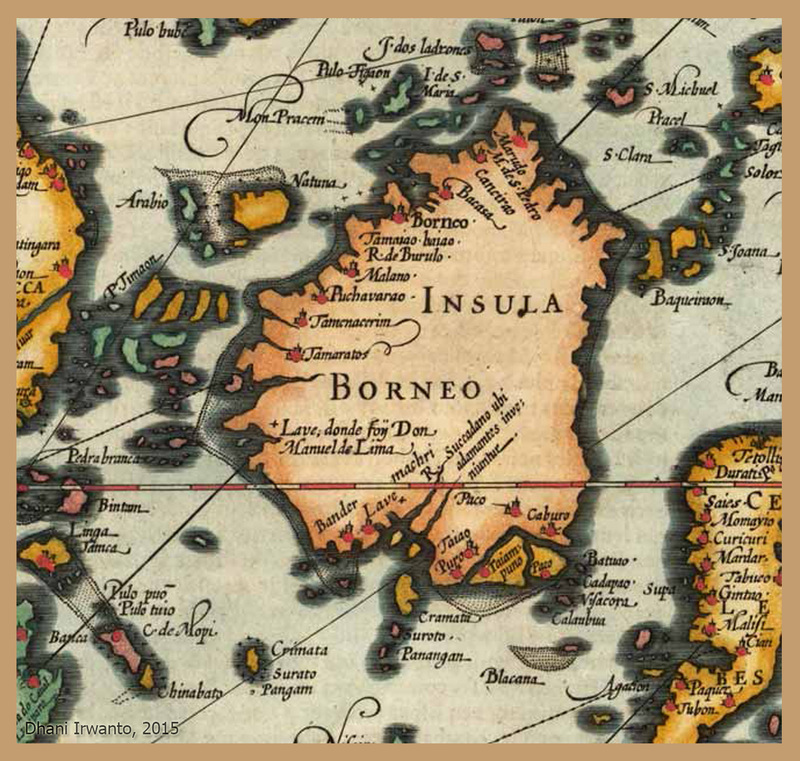 Sebastian Munster’s map of Taprobana drawn in 1580 carries the German title, Sumatera Ein Grosser Insel (“Sumatera, a large island”). The old debate was settled earlier in favor of Sri Lanka, but the more recent display of Munster’s map with its title has reignited the debate. Munster’s map was “a fine example” of the difficulties Renaissance map makers had in placing the continents of the world. 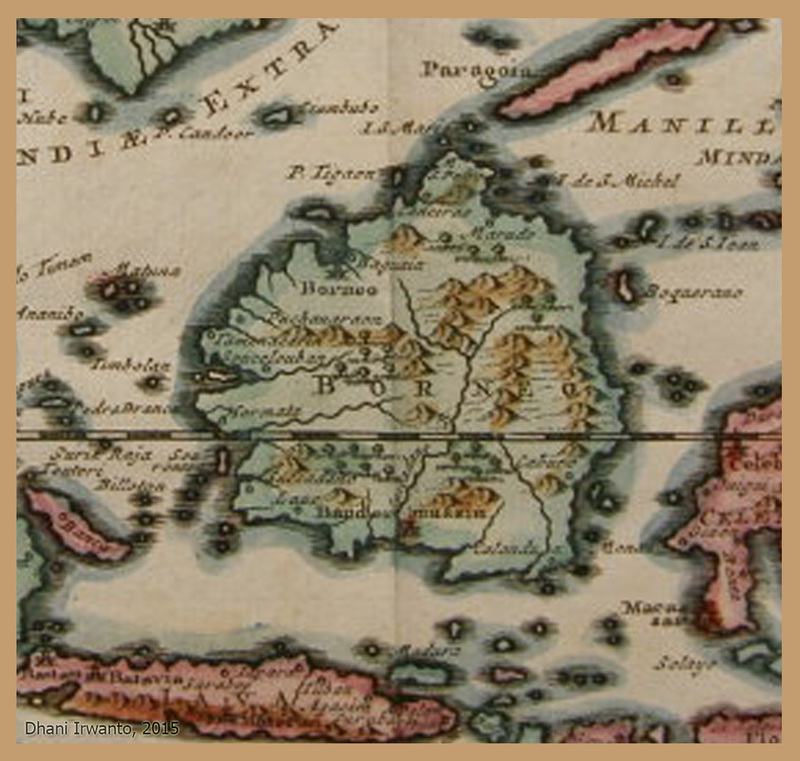 It showed the cartographic confusion that Europeans had trying to understand the geography of Asia. What still baffles everyone is the exaggerated size of Taprobana if Ptolemy really meant the isle to represent present day Sri Lanka. In contrast, the sub-continent of India which is shown in the map is far smaller in dimensions. It was true that Sri Lanka by Ptolemy’s time was a well-known island as it was centrally situated in the Indian Ocean but India and her products were equally known from the pre-Christian era, starting with the Persian occupation of territory up to the river Sind and Alexander’s conquests following that as well as through sea-borne trade. On the contrary, Taprobana, despite its sheer size, was assigned by Ptolemy with trade in elephants and golden spices. Both Sri Lanka and Sumatera were known for these two commodities, and the latter more so for spices but it is Sri Lanka which had better historical record for elephants. The intelligence displayed by Sri Lankan elephants and easier transport across the Indian continent perhaps, accounted for preference for them. Sri Lankan elephants began to be exploited in a big way only after the East African resources dwindled. Under the Mongol Empire’s hegemony over Asia (the Pax Mongolica, or Mongol peace), Europeans had long enjoyed a safe land passage, the Silk Road to India (the Indies, a far larger region than modern India) and China, which were sources of valuable goods such as spices and silk. In the early centuries AD, Indians and Westerners called Southeast Asia the “Golden Peninsula”, the “Land of Gold”, and it was not long thereafter that the region became known for its pepper and the products of its rainforests, first aromatic woods and resins, and then the finest and rarest of spices. From the seventh to the tenth centuries Arabs and Chinese thought of Southeast Asia’s gold, as well as the spices that created it; by the fifteenth century sailors from ports on the Atlantic, at the opposite side of the hemisphere, would sail into unknown oceans in order to find these Spice Islands. They all knew that Southeast Asia was the spice capital of the world. From roughly 1000 AD until the nineteenth-century ‘industrial age’, all world trade was more or less governed by the ebb and flow of spices in and out of Southeast Asia. Throughout these centuries the region and its products never lost their siren quality. Palm trees, gentle surf, wide beaches, steep mountain slopes covered with lush vegetation, birds and flowers of brilliant colors, as well as orange and golden tropical sunsets have enchanted its visitors as well as its own people through the ages. Indeed, it is said that when in the last years of the sixteenth century the first Dutch ship arrived at one of the islands of the Indonesian archipelago, the entire crew jumped ship, and it took their captain two years to gather them for the return trip to Holland. In the international trading by land and water several major empires were involved. At the western end of the caravan and sea routes (the famous Silk Roads) was the Roman Empire, which at the time included the countries around the Mediterranean, Egypt, the Levant and Arabia. From there the trade routes ran east through the kingdoms of the Parthians and the Kushans in Central Asia and northern India, through the land of the Shaka (Indo-Scythians) and Shatavahana in northern and central India, to the South Indian kingdoms of the Cheras, Pandyas and Cholas and, continuing via Sri Lanka and the Bay of Bengal, to Funan in present-day South Vietnam and to China, at the eastern end of the Silk Roads. The Chinese Han dynasty traded indirectly with Rome, be it on the caravan routes that led through Central Asia to India, the Persian Gulf and finally to the eastern Mediterranean, be it across the oceans, from the South China Sea, across the Indian Ocean, the Persian Gulf, the Arabian Sea and the Red Sea as far as Alexandria and Rome. 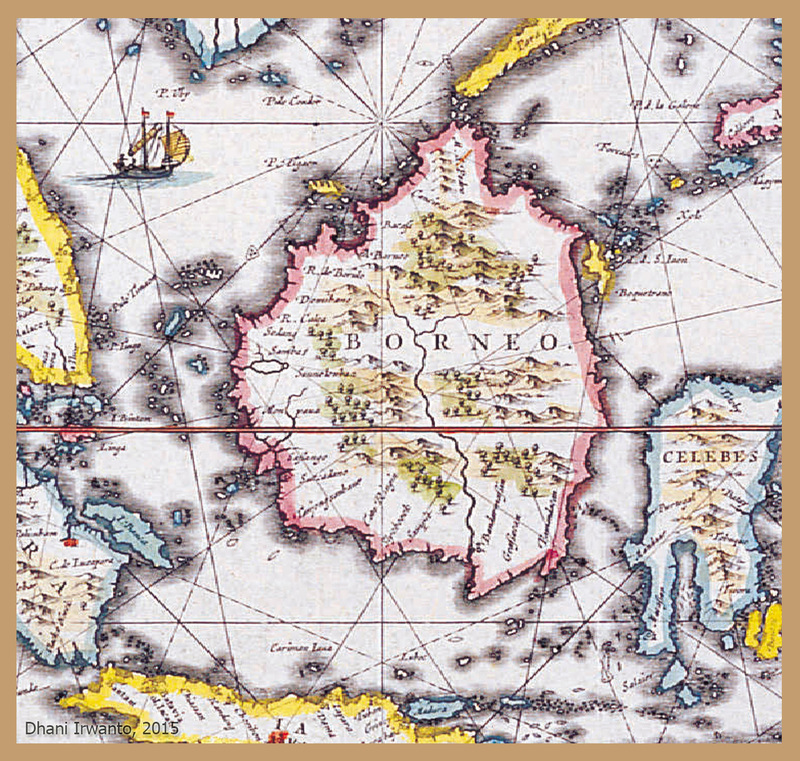 The Southeast Asian archipelago with its medicines, spices and aromatic substances, with precious timbers and tortoise shell was an important link in this far-reaching trade network, interconnecting continents. With the fall of Constantinople to the Ottoman Turks in 1453, the land route to Asia became much more difficult and dangerous. 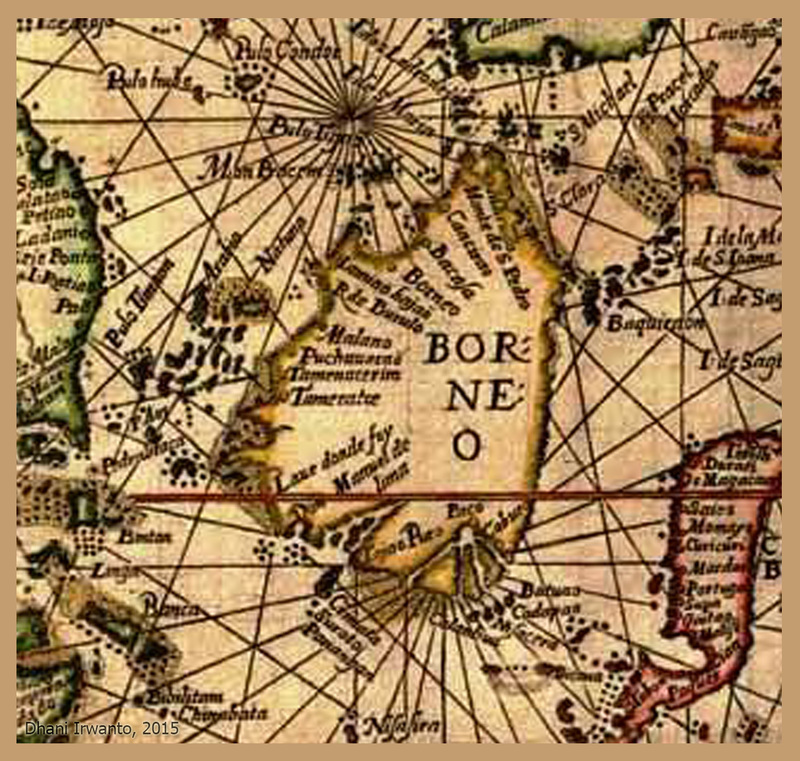 Portuguese navigators tried to find a sea way to Asia. 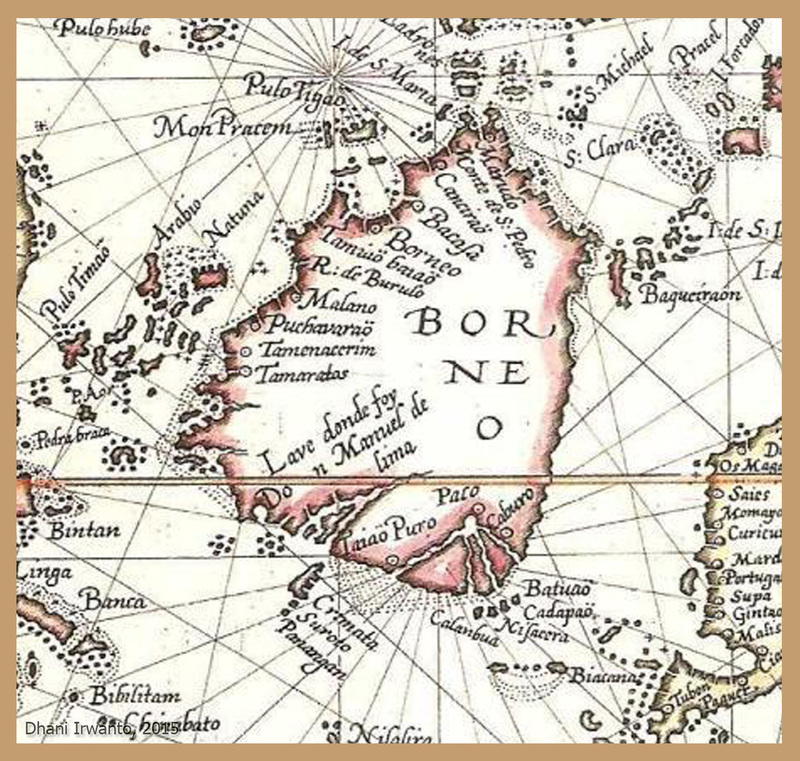 In 1470 the Florentine astronomer Paolo dal Pozzo Toscanelli suggested to King Afonso V of Portugal that sailing west would be a quicker way to reach the Spice Islands, Cathay (China) and Cipangu (Japan) than the route round Africa. Afonso rejected his proposal. Portuguese explorers, under the leadership of King John II, then developed a passage to Asia by sailing around Africa. Major progress in this quest was achieved in 1488, when Bartolomeu Dias reached the Cape of Good Hope, in what is now South Africa. Meanwhile, in the 1480s, the Columbus brothers had picked up Toscanelli’s suggestion and proposed a plan to reach the Indies (then construed roughly as all of south and east Asia) by sailing west across the “Ocean Sea”, ie the Atlantic. During his first voyage in 1492, instead of arriving at Japan as he had intended, Columbus reached the New World, landing on an island in the Bahamas archipelago that he named “San Salvador”. Over the course of three more voyages, Columbus visited the Greater and Lesser Antilles, as well as the Caribbean coast of Venezuela and Central America, claiming all of it for the Crown of Castile. Portugal was the first European power to establish a bridgehead on the lucrative maritime Southeast Asia trade route, with the conquest of the Sultanate of Malaka in 1511. The Netherlands and Spain followed and soon superseded Portugal as the main European powers in the region. In 1599, Spain began to colonize the Philippines. 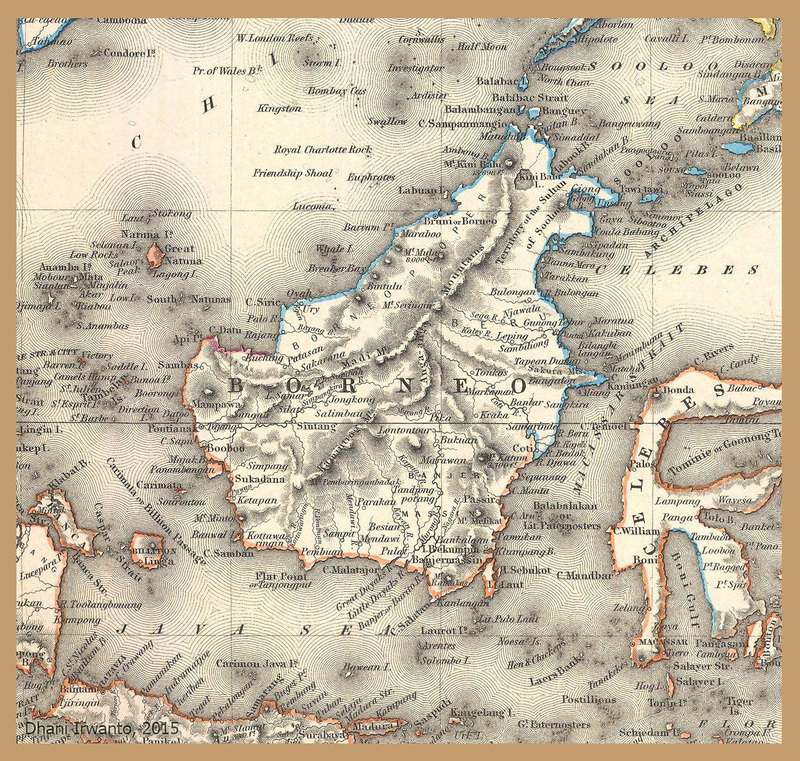 In 1619, acting through the Dutch East India Company, the Dutch took the city of Sunda Kelapa, renamed it Batavia (now Jakarta) as a base for trading and expansion into the other parts of Java and the surrounding territory. In 1641, the Dutch took Malaka from the Portuguese. Economic opportunities attracted Overseas Chinese to the region in great numbers. In 1775, the Lanfang Republic, possibly the first republic in the region, was established in West Kalimantan, Indonesia, as a tributary state of the Qing Empire; the republic lasted until 1884, when it fell under Dutch occupation as Qing influence waned. Englishmen of the United Kingdom, in the guise of the Honorable East India Company led by Josiah Child, had little interest or impact in the region, and were effectively expelled following the Siam-England war in 1687. Britain, in the guise of the British East India Company, turned their attention to the Bay of Bengal following the Peace with France and Spain in 1783. During the conflicts, Britain had struggled for naval superiority with the French, and the need of good harbors became evident. 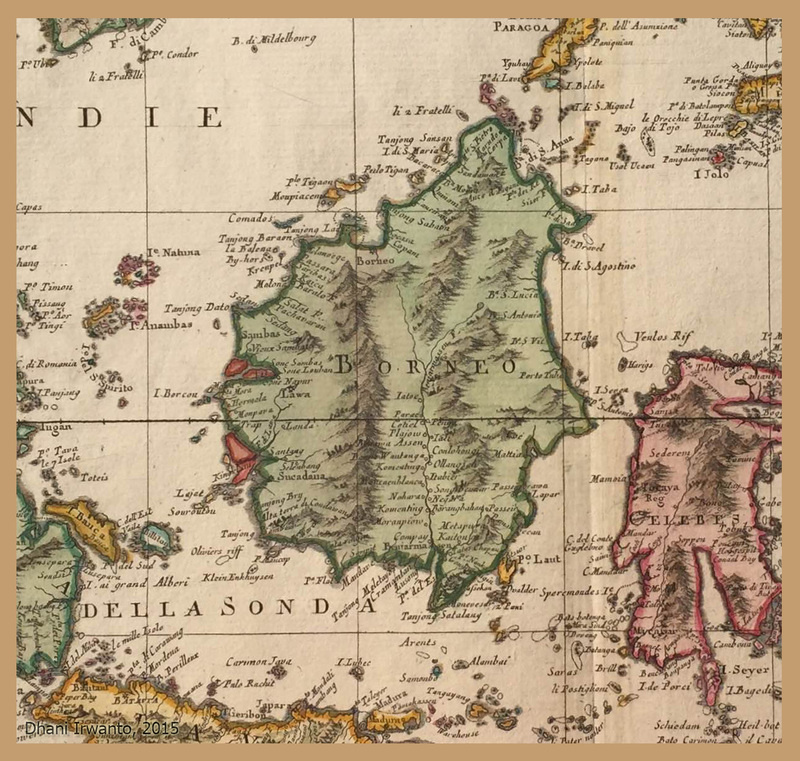 Penang Island had been brought to the attention of the Government of India by Francis Light. In 1786 a settlement was formed under the administration of Sir John Macpherson, which formally began British expansion into the Malay States of Southeast Asia. The British also temporarily possessed Dutch territories during the Napoleonic Wars; and Spanish areas in the Seven Years’ War. In 1819, Stamford Raffles established Singapore as a key trading post for Britain in their rivalry with the Dutch. However, their rivalry cooled in 1824 when an Anglo-Dutch treaty demarcated their respective interests in Southeast Asia. British rule in Burma began with the first Anglo-Burmese War (1824 – 1826). Long before the era of global positioning satellites and multi-spectrum ortho-photography, ancient cartographers frequently had to rely on word of mouth to describe far-away places. Sometimes, they would draw sea-monsters on maps to fill in the empty spaces. Other times, they would expand the size of a place they had heard of, and add their own detail. When the ancient mapmakers first began representing the earth’s surface on a map, they simply drew geographic features as they saw them or as travelers and explorers described them. Because so little was known about the world, information on maps was rather sparse and it was difficult to evaluate a map’s quality or accuracy. In fact, most maps created before the European Renaissance were so generalized and inaccurate that the mapmakers could have assumed we lived on a flat earth and it wouldn’t have made the slightest difference to the map’s usefulness. 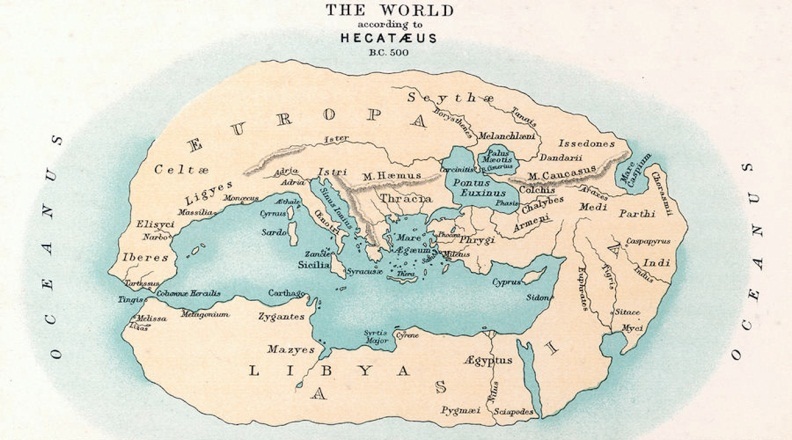 Hecataeus, a scholar of Miletus, probably produced the first book on geography in about 500 BC. A generation later Herodotus, from more extensive studies and wider travels, expanded upon it. A historian with geographic leanings, Herodotus recorded, among other things, an early circumnavigation of the African continent by Phoenicians. He also improved on the delineation of the shape and extent of the then-known regions of the world, and he declared the Caspian to be an inland sea, opposing the prevailing view that it was part of the “northern oceans”. Figure 1. Reconstruction of the world map according to Hecataeus (ca 500 BC). Although Hecataeus regarded the Earth as a flat disk surrounded by ocean, Herodotus and his followers questioned the concept and proposed a number of other possible forms. Indeed, the philosophers and scholars of the time appear to have been preoccupied for a number of years with discussions on the nature and extent of the world. Some modern scholars attribute the first hypothesis of a spherical Earth to Pythagoras (6th century BC) or Parmenides (5th century). The idea gradually developed into a consensus over many years. In any case by the mid-4th century the theory of a spherical Earth was well accepted among Greek scholars, and about 350 BC Aristotle formulated six arguments to prove that the Earth was, in truth, a sphere. From that time forward, the idea of a spherical Earth was generally accepted among geographers and other scholars. Figure 2. 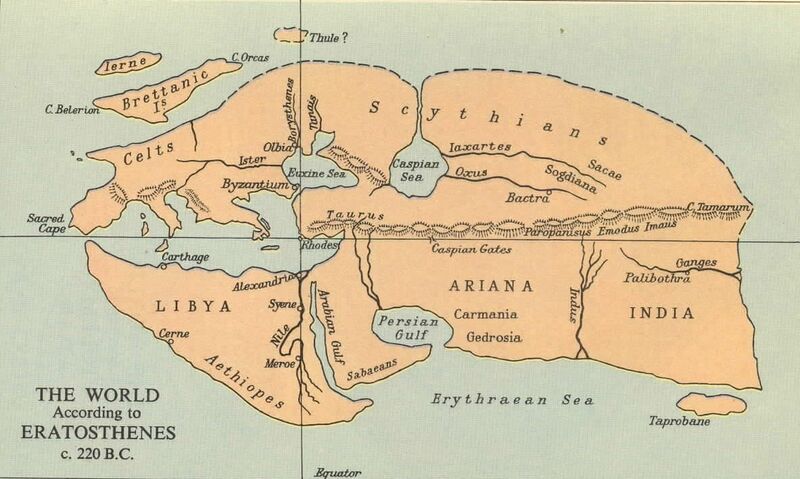 Reconstruction of the world map according to Herodotus (ca 430 BC). About 300 BC, Dicaearchus, a disciple of Aristotle, placed an orientation line on the world map, running east and west through Gibraltar and Rhodes. Eratosthenes, Marinus of Tyre, and Ptolemy successively developed the reference-line principle until a reasonably comprehensive system of parallels and meridians, as well as methods of projecting them, had been achieved. Figure 3. 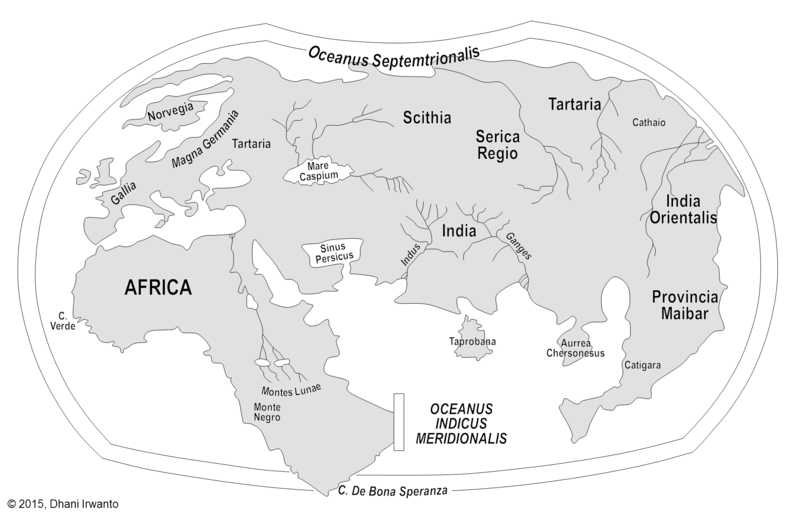 Reconstruction of the world map according to Dicaearchus (ca 300 BC). Eratosthenes (276 – 194 BC) drew an improved world map, incorporating information from the campaigns of Alexander the Great and his successors. 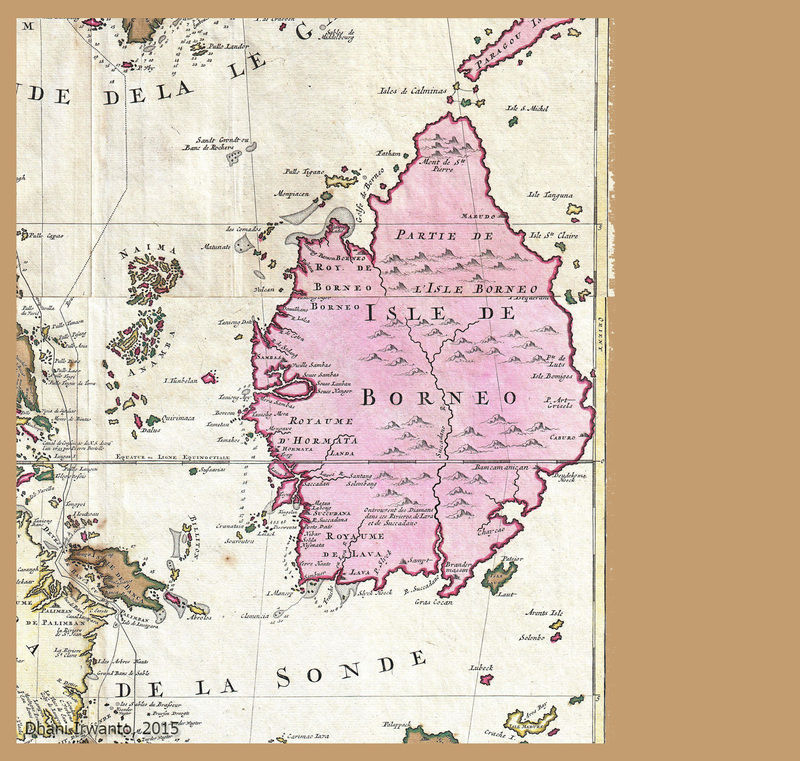 Asia became wider, reflecting the new understanding of the actual size of the continent. Eratosthenes was also the first geographer to incorporate parallels and meridians within his cartographic depictions, attesting to his understanding of the spherical nature of the earth. 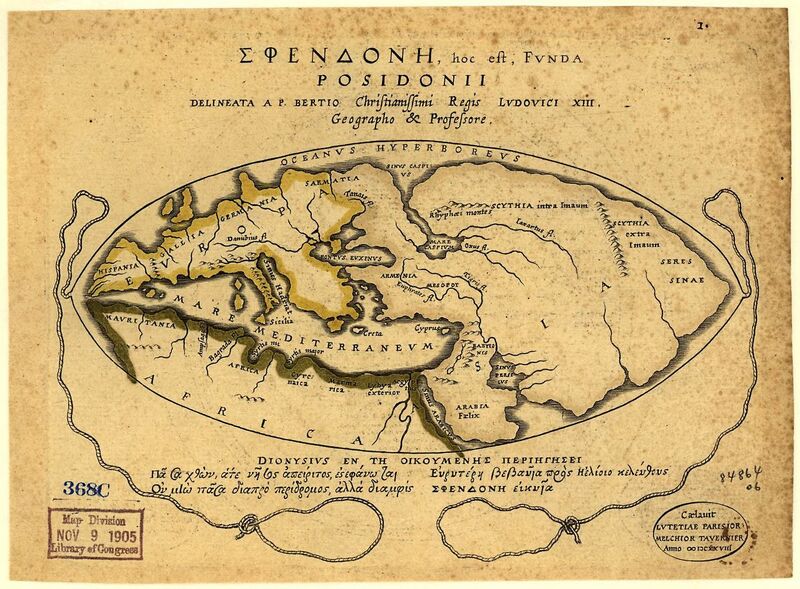 Posidonius (ca 150 – 130 BC) work “about the ocean and the adjacent areas” was a general geographical discussion, showing how all the forces had an effect on each other and applied also to human life. He measured the Earth’s circumference by reference to the position of the star Canopus. His measure of 240,000 stadia translates to 24,000 miles, close to the actual circumference of 24,901 miles. He was informed in his approach by Eratosthenes, who a century earlier used the elevation of the Sun at different latitudes. Both men’s figures for the Earth’s circumference were uncannily accurate, aided in each case by mutually compensating errors in measurement. However, the version of Posidonius’ calculation popularized by Strabo was revised by correcting the distance between Rhodes and Alexandria to 3,750 stadia, resulting in a circumference of 180,000 stadia, or 18,000 miles. Ptolemy discussed and favored this revised figure of Posidonius over Eratosthenes in his Geographia, and during the Middle Ages scholars divided into two camps regarding the circumference of the Earth, one side identifying with Eratosthenes’ calculation and the other with Posidonius’ 180,000 stadia measure. Depending on the value of the stadia that is adopted, it may be true that Posidonius, seeking to improve on Eratosthenes, underestimated the size of the earth, and this measurement, copied by Ptolemy, and was thereafter transmitted to Renaissance Europe. Strabo (ca 64 BC – 24 AD) is mostly famous for his 17-volume work Geographica, which presented a descriptive history of people and places from different regions of the world known to his era. The Geographica first appeared in Western Europe in Rome as a Latin translation issued around 1469. 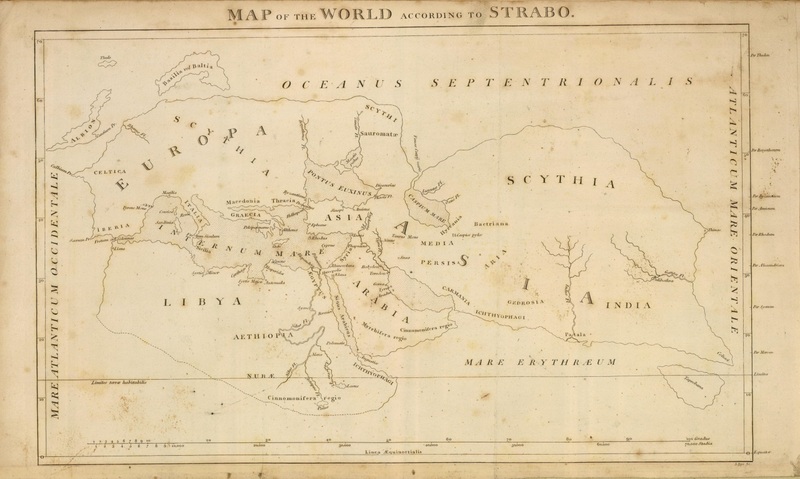 Although Strabo referenced the antique Greek astronomers Eratosthenes and Hipparchus and acknowledged their astronomical and mathematical efforts towards geography, he claimed that a descriptive approach was more practical. Geographica provides a valuable source of information on the ancient world, especially when this information is corroborated by other sources. Within the books of Geographica is a map of Europe. 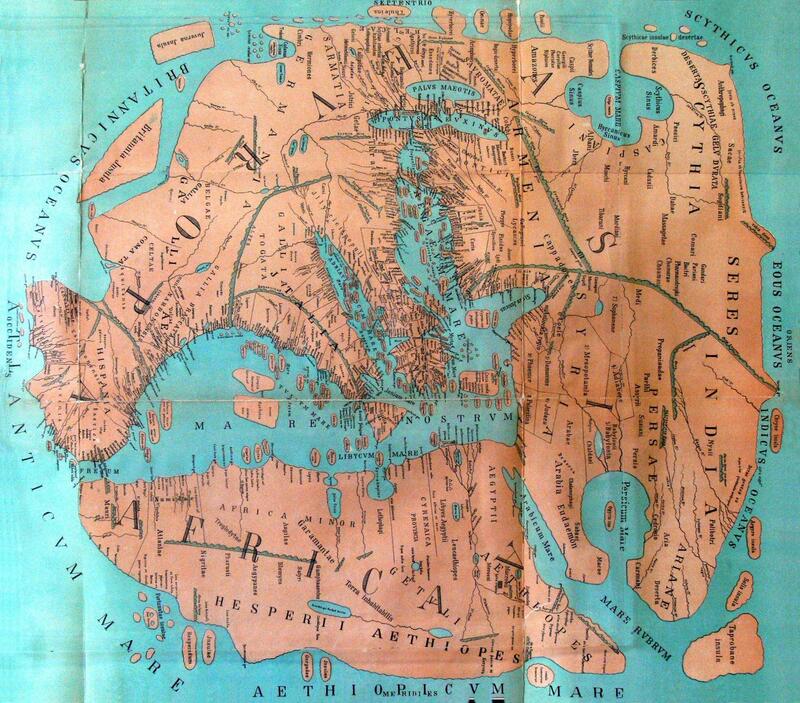 Whole world maps according to Strabo are reconstructions from his written text. Pomponius Mela (ca 43 AD) is unique among ancient geographers in that, after dividing the earth into five zones, of which two only were habitable, he asserts the existence of antichthones, people inhabiting the southern temperate zone inaccessible to the folk of the northern temperate regions due to the unbearable heat of the intervening torrid belt. On the divisions and boundaries of Europe, Asia and Africa, he repeats Eratosthenes; like all classical geographers from Alexander the Great (except Ptolemy) he regards the Caspian Sea as an inlet of the Northern Ocean, corresponding to the Persian (Persian Gulf) and Arabian (Red Sea) gulfs on the south. Figure 7. A 1898 reconstruction of Pomponius Mela view of the World. The greatest figure of the ancient world in the advancement of geography and cartography was Claudius Ptolemaeus (Ptolemy; 90 – 168 AD). An astronomer and mathematician, he spent many years studying at the library in Alexandria, the greatest repository of scientific knowledge at that time. He pioneered the use of curving parallels and converging meridians on maps. Ptolemy’s maps were “Mediterranean specific”, very generalized, and almost completely ignored the Southern Hemisphere. Still, they were a significant step forward in mapmaking and so far ahead of their time, they were used well into the Renaissance. Figure 8. 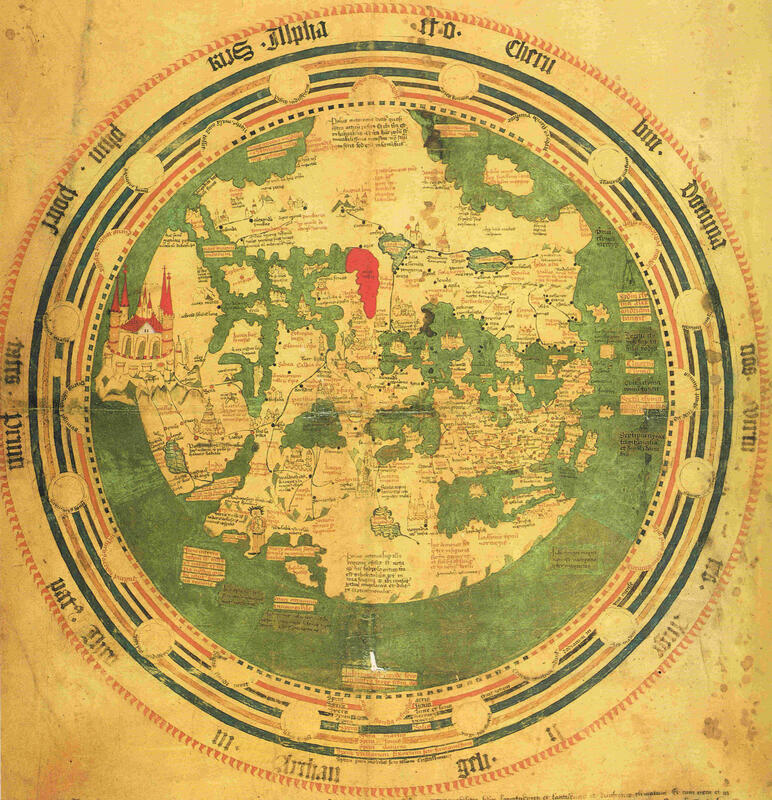 Ptolemy’s map of the world by Johane Schnitzer (Ulm: Leinhart Holle, 1482). The original map was lost. 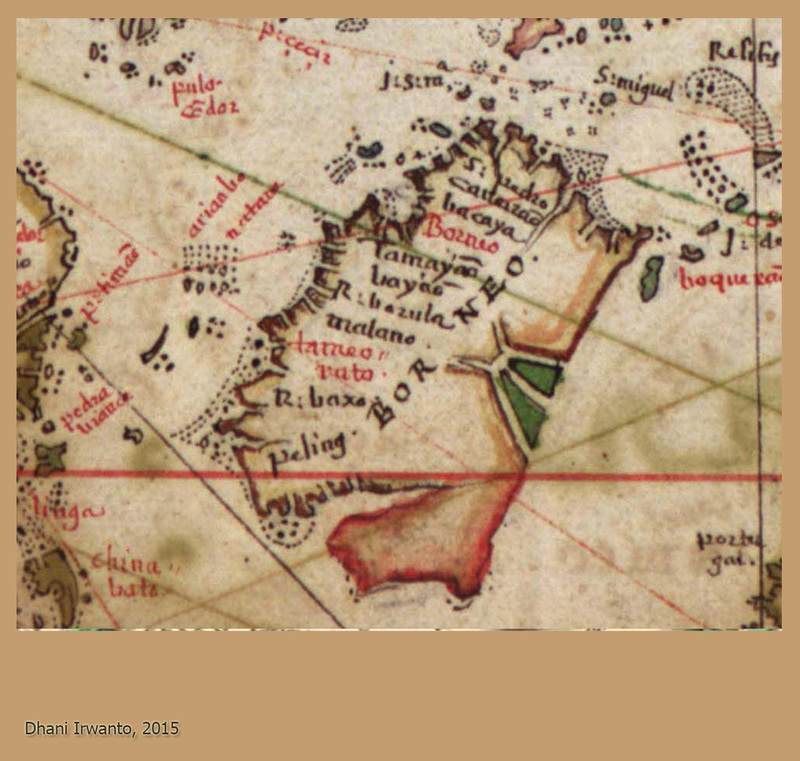 The Arab geographer, Muhammad Al-Idrisi (1154 AD), incorporated the knowledge of Africa, the Indian Ocean and the Far East gathered by Arab merchants and explorers with the information inherited from the classical geographers to create the most accurate map of the world at the time. It remained the most accurate world map for the next three centuries. 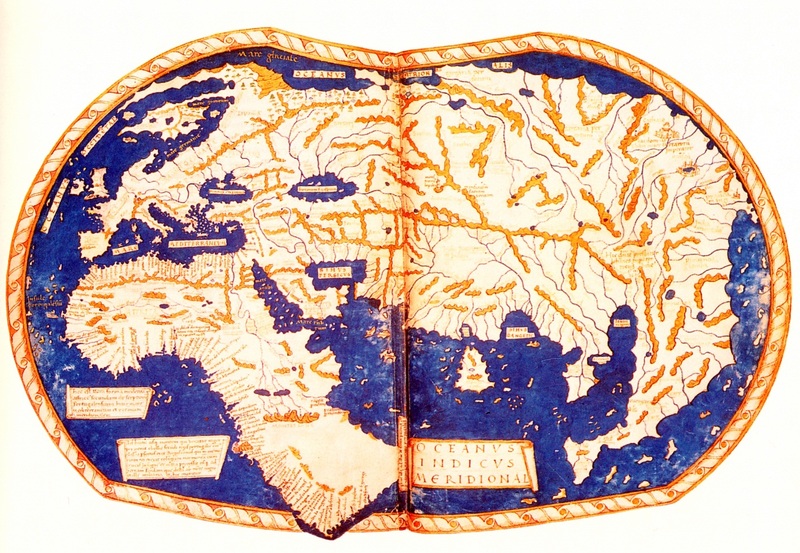 The Tabula Rogeriana was drawn by Al-Idrisi in 1154 for the Norman King Roger II of Sicily, after a stay of eighteen years at his court, where he worked on the commentaries and illustrations of the map. The map, written in Arabic, shows the Eurasian continent in its entirety, but only shows the northern part of the African continent. Abraham Cresques of a family of Catalonian Jews who worked in Majorca created an atlas known as the Catalan Atlas in 1375, as requested by King Charles V of France from Peter of Aragon at a time when the reputation of the Catalan chart makers was at its peak. Abraham Cresques is the patron of the best Majorcan mapmaker of the time. The atlas that resulted contained the latest information on Asia and China and has subsequently been called “the most complete picture of geographical knowledge as it stood in the later Middle Ages”. The Catalan Atlas originally consisted of six vellum leaves folded down the middle, painted in various colors including gold and silver. The leaves are now cut in half. The first two leaves contain texts in Catalan covering cosmography, astronomy and astrology. The four remaining leaves make up the actual map, which is divided into two principal parts. The first two leaves, forming the oriental portion of the Catalan Atlas, illustrate numerous religious references as well as a synthesis of medieval mappae mundi and the travel literature of the time, notably Marco Polo’s Book of Marvels and Mandeville’s Travels and Voyage of Sir John Mandeville. Many Indian and Chinese cities can be identified. South-east of the coast of Cathay are numerous islands – they number 7,548 – in which they are rich in gold, silver, spices and precious stones, so much so that “great ships of many different nations” trade in their waters. In the extreme corner is a portion of a great island which is named Taprobana (written as “Trapobana”). A legend states that it is the last island in the East, and is called by the Tartars ‘Great Caulij’. A German cartographer and a Benedictine monk Andreas Walsperger created a a Latin Mappa Mundi in around 1448. The map is atypical in its depiction of Africa and in its placing a large castle in China, where others including Fra Mauro’s place their grand castle to the north. The world map of Henricus Martellus Germanus (Heinrich Hammer), ca 1490, was remarkably similar to the terrestrial globe later produced by Martin Behaim in 1492, the Erdapfel. Both show heavy influences from Ptolemy, and both possibly derive from maps created around 1485 in Lisbon by Bartolomeo Columbus. Although Martellus is believed to have been born in Nuremberg, Behaim’s home town, he lived and worked in Florence from 1480 to 1496. The Cantino planisphere or world map is the earliest surviving map showing Portuguese geographic discoveries in the east and west. It is named after Alberto Cantino, an agent for the Duke of Ferrara, who successfully smuggled it from Portugal to Italy in 1502. 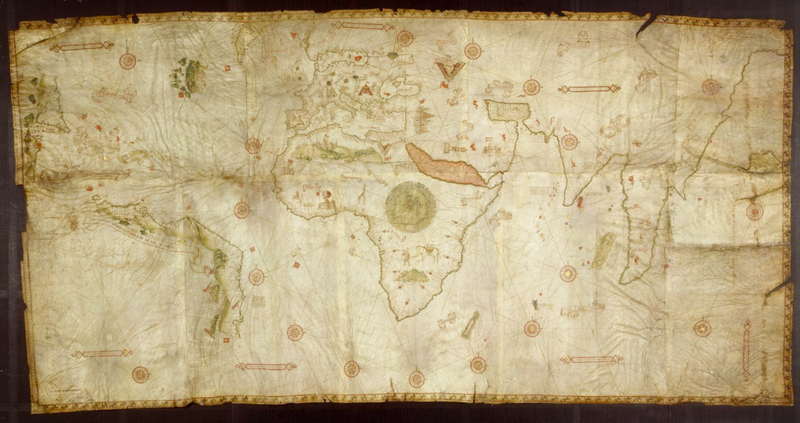 The map is particularly notable for portraying a fragmentary record of the Brazilian coast, discovered in 1500 by the Portuguese explorer Pedro Álvares Cabral, and for depicting the African coast of the Atlantic and Indian Oceans with a remarkable accuracy and detail. It was valuable at the beginning of the sixteenth century because it showed detailed and up-to-date strategic information in a time when geographic knowledge of the world was growing at a fast pace. 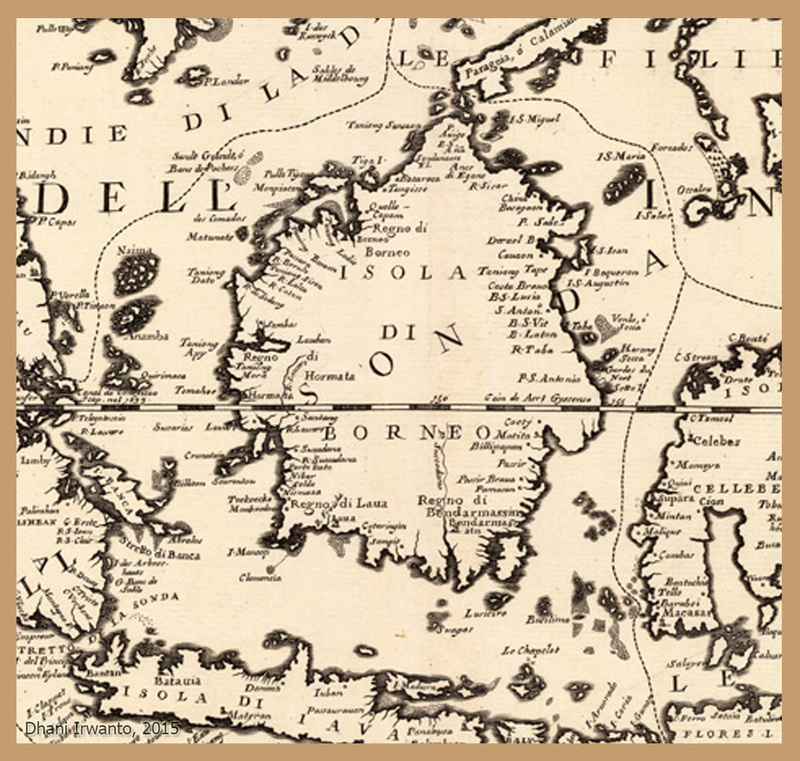 It is important in our days because it contains unique historical information about the maritime exploration and the evolution of nautical cartography in a particularly interesting period. The Cantino planisphere is the earliest extant nautical chart where places (in Africa and parts of Brazil and India) are depicted according to their astronomically observed latitudes. The Caverio Map, also known as Caveri Map or Canerio Map, is a map drawn by Nicolay de Caveri, circa 1505. It is hand drawn on parchment and colored, being composed of ten sections or panels, measuring 2.25 by 1.15 meters (7.4 by 3.8 feet). Historians believe that this undated map signed with “Nicolay de Caveri Januensis” was completed in 1504 – 1505. It was probably either made in Lisbon by the Genoese Canveri, or copied by him in Genoa from the very similar Cantino map. It shows the east coast of North America with surprising detail, if the east coast of North America is compared with modern-day maps, we will be struck by its immediately noticeable similarity with the coastline stretching from Florida to the Delaware or Hudson River, when we consider the general belief that the Europeans neither saw nor set foot on the beaches in the southern states of the present-day USA. It was one of the primary sources used to make the Waldseemüller map in 1507. Caverio map is currently at Bibliothèque Nationale de France in Paris. The story of the small group of Renaissance intellectuals that worked at San Die, a small city in the Alzace (France) from 1500 onwards is well known. The team was financed by Duc Rene II de Lorraine, represented in the team by Walter Ludd. Martin Ringmann was the writer and Martin Waldseemüller the geographer. They set themselves to analyze new geographical information coming from the earliest of voyages of discovery and integrate that information into existing maps and atlases. The effort led to the publication of an important booklet, Universalis Cosmographia (1507); one of the most important wall maps of the world ever published and a globe, published the same year. From this revolution in cartography a new line of editions of Ptolemy’s Geographia was born (1513; 1520; 1522; 1535; 1541) which brought together old with new knowledge of the world. 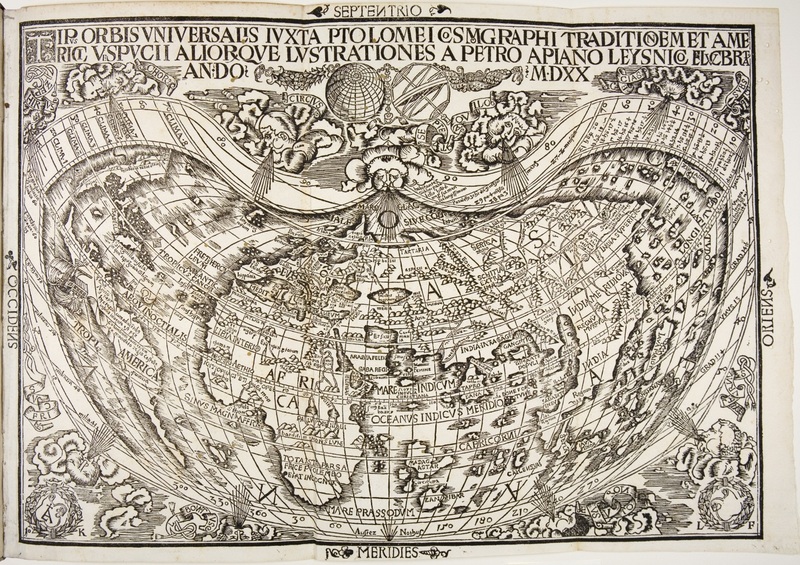 Waldseemüller’s large world map was the most exciting product of that research effort, and included data gathered during Amerigo Vespucci’s voyages of 1501 – 1502 to the New World. Waldseemüller christened the new lands “America” in recognition of Vespucci’s understanding that a new continent had been uncovered as a result of the voyages of Columbus and other explorers in the late fifteenth century. This is the only known surviving copy of the first printed edition of the map, which, it is believed, consisted of 1,000 copies. Waldseemüller’s map supported Vespucci’s revolutionary concept by portraying the New World as a separate continent, which until then was unknown to the Europeans. It was the first map, printed or manuscript, to depict clearly a separate Western Hemisphere, with the Pacific as a separate ocean. The map represented a huge leap forward in knowledge, recognizing the newly found American landmass and forever changing the European understanding of a world divided into only three parts – Europe, Asia, and Africa. Lorenz Fries (ca 1490 – ca 1531 AD) was a physician, astrologer and geographer who is perhaps best-known to cartophiles for his re-working of Martin Waldseemüller’s maps from Claudius Ptolemy’s Geographia. Karrow suggests in his Mapmakers of The Sixteenth Century and Their Maps that Fries had studied at Vienna, Montpellier, Piacenza and Pavia before working in Schlettstadt, Colmar, Fribourg and Strasbourg. Fries’ early publications were related to medicine and he experienced some success in this field. His publisher was Gruninger, in Strasbourg, who was also known to have worked in collaboration with Waldseemuller on the Chronica Mundi, a cosmography planned for publication. It seems likely that this small volume was to help form Fries’ considerable involvement with Waldseemüller maps. The first of Waldseemüller’s map to receive a re-working by Fries, and also worked on by Peter Apian, was the Tipus Orbis Universalis in 1520, which was based on Waldseemüller’s 1507 map of the world. 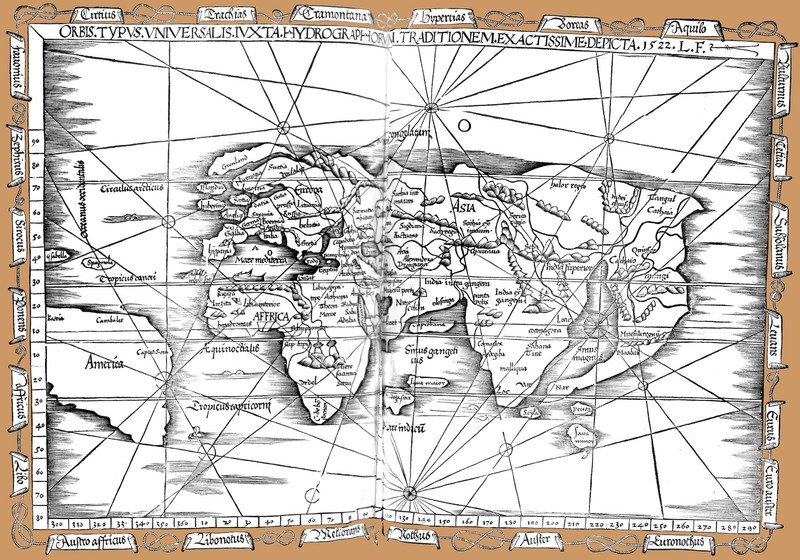 At the same time as this world map was being published, Fries was also working on an edition of Ptolemy’s “Geographia”. The aforementioned Chronica Mundi did not reach publication, perhaps because of Waldseemüller’s death in 1518, and Gruninger, the publisher, decided instead to have Fries work on an edition of Ptolemy using the maps that might have otherwise been included in the Chronica Mundi. Thus, Fries’ first edition of Waldseemüller’s Ptolemy appeared in Strasbourg in 1522 – it was very similar to Waldseemüller’s own 1513 version although Fries’ maps were cut at a slightly reduced size. Three maps were new to this edition (although were based on Waldseemüller’s map of 1507); the world, South-East Asia and eastern Asia (showing China and Tartary). Fries’ woodblocks were used again in three subsequent editions of 1525, published in Strasbourg and edited by Willibald Pirkheimer in 1535, published in Lyons and edited by Michael Servetus in 1541, also published in Lyons – a re-print of the 1535 edition. 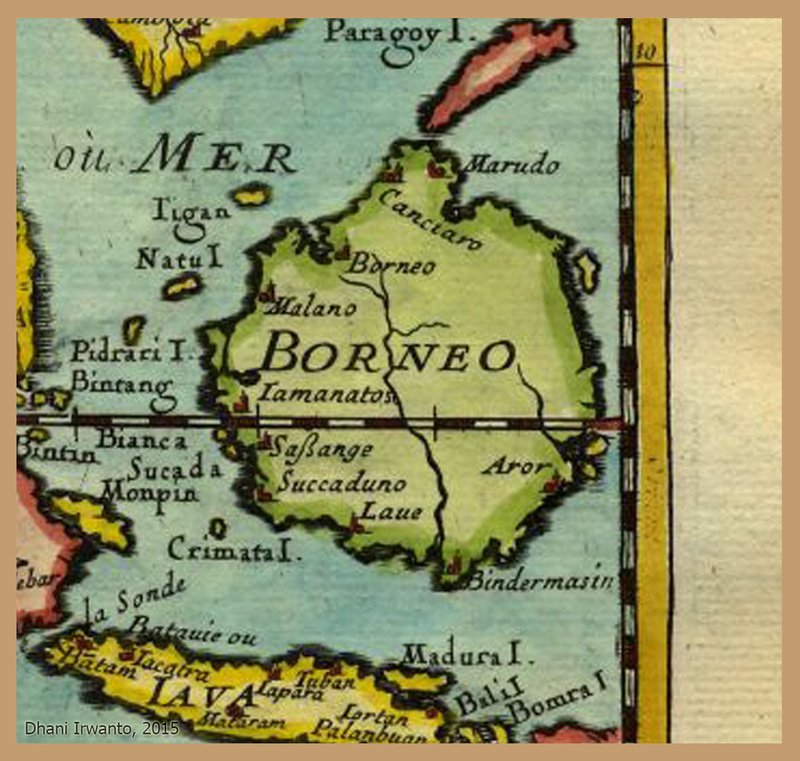 Abraham Ortelius (1527 – 1598 AD) was conventionally recognized as the creator of the first modern atlas. 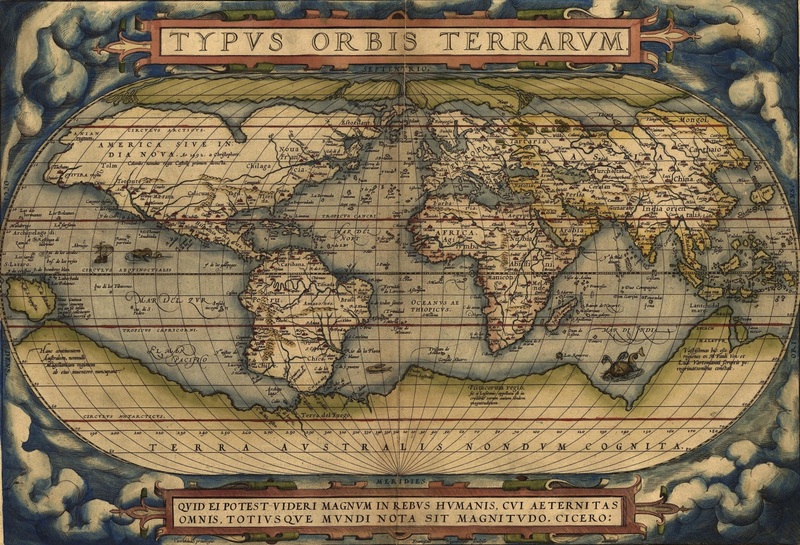 In 1564 he published his first map, Typus Orbis Terrarum, an eight-leaved wall map of the world, on which he identified the Regio Patalis with Locach as a northward extension of the Terra Australis, reaching as far as New Guinea. Many of his atlas’ maps were based upon sources that no longer exist or are extremely rare. Ortelius appended a unique source list (the Catalogus Auctorum) identifying the names of contemporary cartographers, some of whom would otherwise have remained obscure. Claudius Ptolemaeus, better known as Ptolemy (ca 90 – 168 AD) made many important contributions to geography and spatial thought. A Greek by descent, he was a native of Alexandria in Egypt, and became known as the most wise and learned man of his time. Although little is known about Ptolemy’s life, he wrote on many topics, including geography, astrology, musical theory, optics, physics, and astronomy. Ptolemy’s text reached Italy from Constantinople in about 1400 and was translated into Latin by Jacobus Angelus of Scarperia around 1406. The first printed edition with maps, published in 1477 in Bologna, was also the first printed book with engraved illustrations. Many editions followed (more often using woodcut in the early days), some following traditional versions of the maps, and others updating them. An edition printed at Ulm in 1482 was the first one printed north of the Alps. Also in 1482, Francesco Berlinghieri printed the first edition in vernacular Italian. Ptolemy’s work in astronomy and geography have made him famous for the ages, despite the fact that many of his theories were in the following centuries proven wrong or changed. Ptolemy collected, analyzed, and presented geographical knowledge so that it could be preserved and perfected by future generations. These ideas include expressing locations by longitude and latitude, representing a spherical earth on a flat surface, and developing the first equal area map projection. Ptolemy’s accomplishments reflect his understanding of spatial relationships among places on earth and of the Earth’s spatial relationships to other celestial bodies. The greatest contribution of Ptolemy was not the maps themselves but the concepts behind the maps. Geographia, a work of seven volumes, the standard geography textbook until the 15th century, transmitted a vast amount of topographical detail to Renaissance scholars, profoundly influencing their conception of the world. Containing instructions for drawing maps of the entire oikoumenè (inhabited world), Geographia was what we would now call an atlas. It included a world map, 26 regional maps, and 67 maps of smaller areas. He illustrated three different methods for projecting the Earth’s surface on a map (an equal area projection, a stereographic projection, and a conic projection), and the calculation of coordinate locations for some eight thousand places on the Earth. He invented the concept of latitude and longitude, a mapping system still commonly used today. Latitude was measured horizontally from the equator, but Ptolemy preferred to express it as the length of the longest day rather than degrees of arc (the length of the mid-summer day increases from 12h to 24h as one goes from the equator to the polar circle), while longitude was measured from the westernmost landmass known to date, El Hierro, one of the Canary Islands off the coast of Spain. Through his publications, Ptolemy dominated European cartography for nearly a millennium and inspired explorers like Christopher Columbus to test the spatial boundaries of the world. Ptolemy was well aware that he knew about only a quarter of the globe. 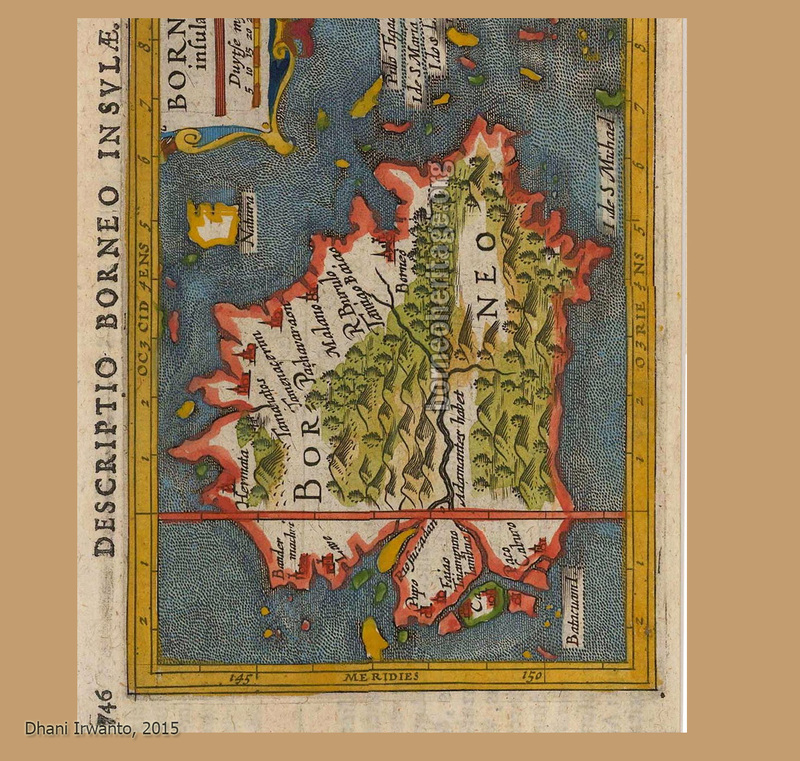 Ptolemy had mapped the whole world from the Fortunatae Insulae (Cape Verde or Canary Islands) eastward to the eastern shore of the Magnus Sinus. This known portion of the world was comprised within 180 degrees. In his extreme east Ptolemy placed Serica (the Land of Silk), the Sinarum Situs (the Port of the Sinae), and the emporium of Cattigara. On the 1489 map of the world by Henricus Martellus, which was based on Ptolemy’s work, Asia terminated in its southeastern point in a cape, the Cape of Cattigara. Cattigara was understood by Ptolemy to be a port on the Sinus Magnus, or Great Gulf, the actual Gulf of Thailand, at eight and a half degrees north of the Equator, on the coast of Cambodia, which is where he located it in his Canon of Famous Cities. It was the easternmost port reached by shipping trading from the Graeco-Roman world to the lands of the Far East. His ability to take in and understand the incredible amount of information developed before his time, add to it, and synthesis it into a map or a book of maps changed how people understood, perceived, and represented the world. Copies and reprints of Ptolemy’s world maps made up the majority of navigation and factual maps for centuries to come, providing the base information for early European explorers. 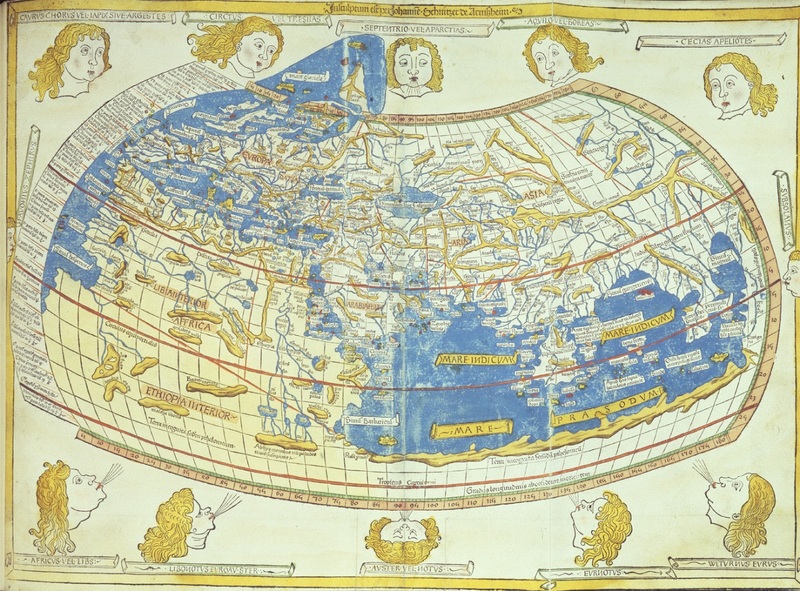 Ptolemy also standardized the orientation of maps, with North at the top and East on the right, thereby placing the known world in the upper left, a standard that remains to this day. Geographia carried a list of the names of some 8,000 places and their approximate latitudes and longitudes. Except for a few that were made by observations, the greater numbers of these locations were determined from older maps, with approximations of distances and directions taken from travelers. 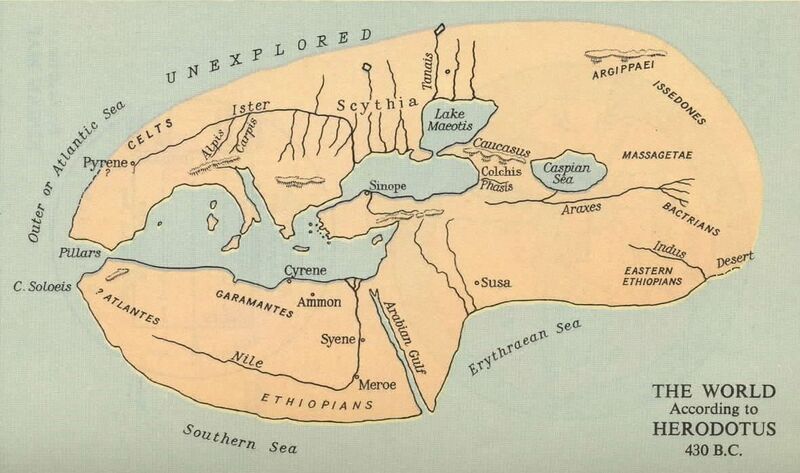 In spite of the more accurate mapping of both Philo and Josephus 100 years earlier, Ptolemy carries on the long tradition of Greek geographers (Strabo, Eratosthenes, Herodotus, Hesiod and Hecataeus). We know very little of Ptolemy’s life. He made astronomical observations from Alexandria in Egypt during the years 127 – 141 AD. The first observation which we can date exactly was made by Ptolemy on 26 March 127 while the last was made on 2 February 141. In fact there is no evidence that Ptolemy was ever anywhere other than Alexandria. It is not surprising that the maps given by Ptolemy were quite inaccurate in many places for he could not be expected to do more than use the available data and this was of very poor quality for anything outside the Roman Empire, and even parts of the Roman Empire are severely distorted. One fundamental error that had far-reaching effects was attributed to Ptolemy – an underestimation of the size of the Earth. He showed Europe and Asia as extending over half of the globe, instead of the 130 degrees of their true extent. Similarly, the span of the Mediterranean ultimately was proved to be 20 degrees less than Ptolemy’s estimate. So lasting was Ptolemy’s influence that 13 centuries later Christopher Columbus underestimated the distances to Cathay and India partly from a recapitulation of this basic error. The prevailing method of mapping in the ancient world was by means of topological itinerary maps and gazetteers that provided their users with useful travel guides. Of primary concern to most travelers was knowledge of definite and relatively unhazardous routes. 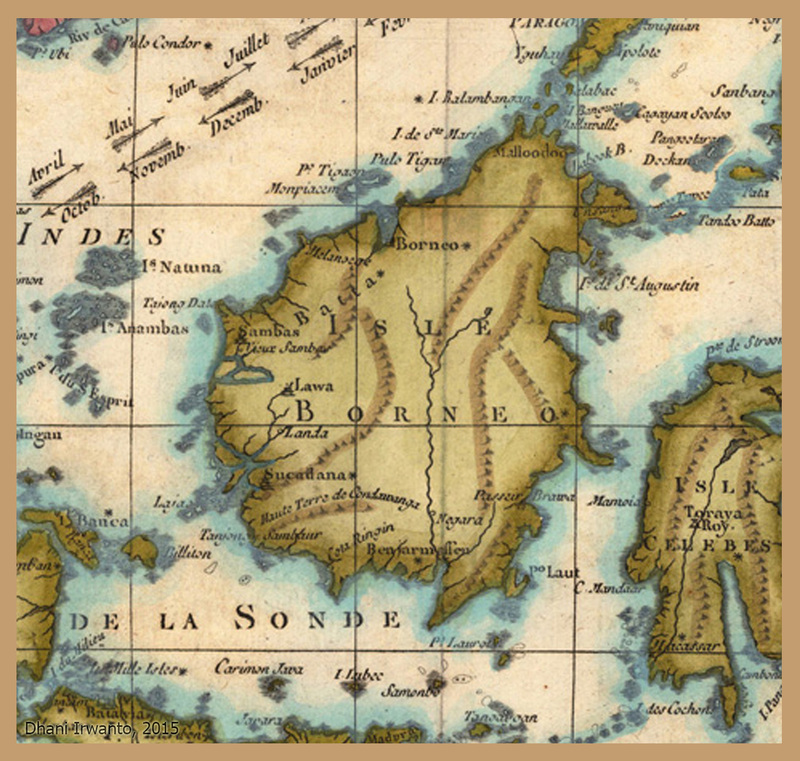 The idea of a world map that placed locations relative to an independent spatial framework, whilst certainly a fascinating scientific curiosity, was both too inaccurate and too uninformative (of terrain, winds, sea currents, etc) to be of any practical use. Ptolemy was fully aware that copying a visual map was guaranteed to introduce a great quantity of error. It also makes vividly clear why attempts to correlate Ptolemy’s map with known locations are rendered more or less unviable. In order to reduce these problems of transmission, his Geographia is separated into two parts. The first, along with his methodology, describes how to draw a map according to two different projections. The second is a catalogue of locations, listing both towns and notable geographical features with their latitude and longitude. The continents are given as Europe, Asia, and Libya (Africa). The World Ocean is only seen to the west. The map distinguishes two large enclosed seas: the Mediterranean and the Indian (Indicum Pelagus). 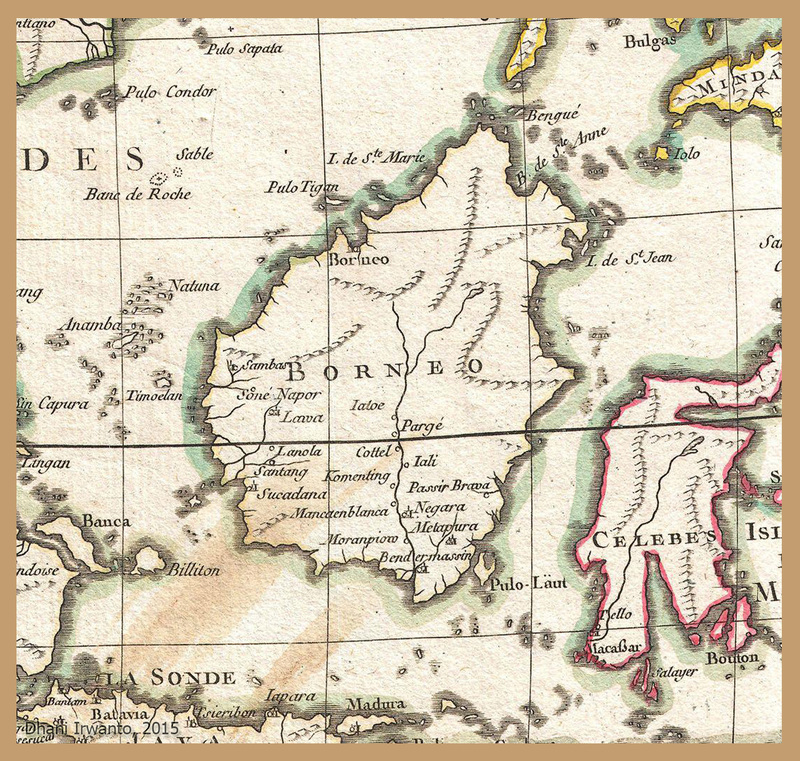 Due to Marinus and Ptolemy’s mistaken measure of the circumference of the earth, the former is made to extend much too far in terms of degrees of arc; due to their reliance on Hipparchus, they mistakenly enclose the latter with an eastern and southern shore of unknown lands, which prevents the map from identifying the western coast of the World Ocean. India is bound by the Indus and Ganges Rivers, but its peninsula is much shortened. 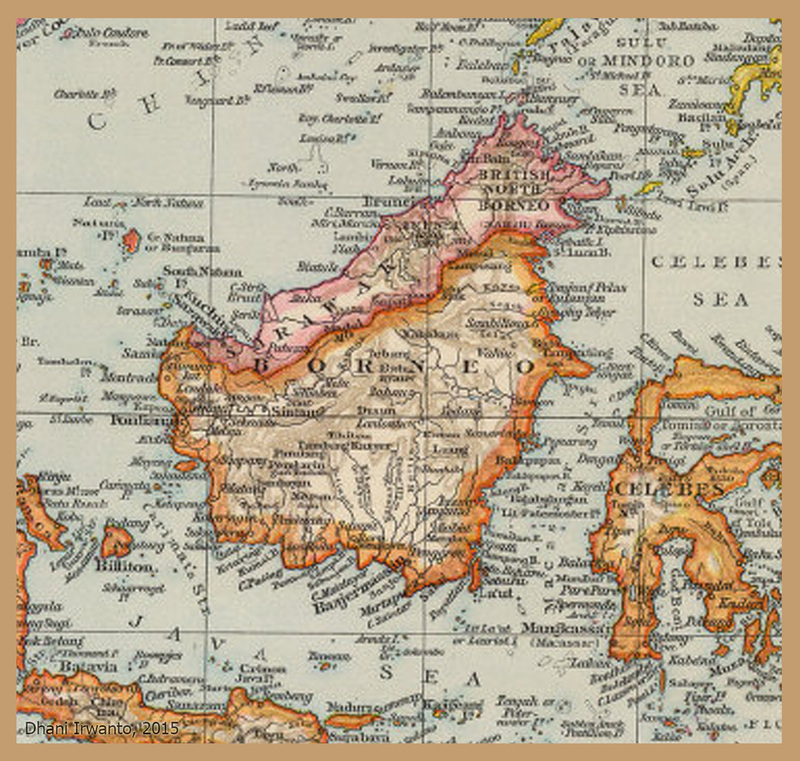 Sumatera is given as Aurea Chersonesus (“Golden Peninsula”) instead of the earlier “Golden Island”, which derived from the works of his predecessor Marinus of Tyre of the mines on Sumatera (or Kalimantan). Beyond the Aurea Chersonesus, the Great Gulf (Magnus Sinus) forms a combination of the Gulf of Thailand and South China Sea which is bound by the unknown lands thought to enclose the Indian Sea. China is divided into two realms – the Qin (Sinae) and the Land of Silk (Serica) – owing to the different accounts received from the overland and maritime Silk Roads. In medieval Europe the concept of “three Indias” was in common circulation. Greater India was the southern part of South Asia, Lesser India was the northern part of South Asia, and Middle India was the region around Ethiopia. The name Greater India (Portuguese: India Maior) was used at least from the mid-15th century. The term, which seems to have been used with variable precision, is sometimes meant only the Indian subcontinent; Europeans used a variety of terms related to South Asia to designate the South Asian peninsula, including High India, Greater India, Exterior India and India Aquosa. However, in some accounts of European nautical voyages, Greater India (or India Major) extended from the Malabar Coast (present-day Kerala) to India extra Gangem (“India, beyond the Ganges”, but usually the East Indies, ie present-day Southeast Asian archipelago) and India Minor, from Malabar to Sind. Farther India was sometimes used to cover all of modern Southeast Asia and sometimes only the mainland portion. In late 19th-century geography, “Greater India” referred to Hindustan (Northwestern Subcontinent) which included the Punjab, the Himalayas, and extended eastwards to Indochina (including Burma), parts of Indonesia (namely, the Sunda Islands, Kalimantan and Sulawesi), and the Philippines. German atlases sometimes distinguished Vorder-Indien (Anterior India) as the South Asian peninsula and Hinter-Indien as Southeast Asia. Taprobana, under the name of the “land of the Antichthones” or Opposite-Earth, was long looked upon as another world. The name was entirely unknown in Europe before the time Alexander the Great invaded India in in 327 BC. The writers who speak of Taprobana are Onesicritus, Eratosthenes, Megasthenes, Hipparchus, Strabo, and Pliny. There are two distinct periods in which Taprobana is mentioned; and a third period when the site, with the name itself, have utterly vanished. The first period is that of the early and ancient writers from the time of Alexander the Great to that of the Emperor Claudius. It embraces notices from Onesicritus, Megasthenes, and Pliny. They all use no other name than that of Taprobana. The second period embraces the time from Ptolemy to that of Cosmas Indicopleustes, late on into the Christian era. About twenty years after Alexander’s death, Megasthenes was sent as ambassador by Seleucus Nicator in 302 BC to Sandracottus (Chandragupta Maurya). From information derived at the court of Sandracottus, Megasthenes described Taprobana as a very fertile island divided by a river. One part was infested by wild beasts and elephants, and the other inhabited by Prachii colonists, and producing gold and gems. Eratosthenes has also given the dimensions of this island, as being 7,000 stadia in length, and 5,000 in breadth. He states also that there were no cities, but villages to the number of 700. It began at the Eastern sea, and laid extended opposite to [Greater] India, east and west. This island was in former times supposed to be 20 days’ sail from the country of the Prasii, but in later times, whereas the navigation was formerly confined to vessels constructed of papyrus with the tackle peculiar to the Nile, the distance had been estimated at no more than 7 days sail, in reference to the speed which could be attained by vessels of their construction. According to Pliny, in the reign of Claudius (41 – 54 AD), a freedman Annius Plocamus, who had farmed from the treasury the Red Sea revenues, while sailing around Arabia was carried away by gales of wind from the north beyond Carmania. In the course of 15 days he had been wafted to Hippuri, a port of Taprobana, where he was humanely received, hospitably entertained by the king, and having in six months time to acquire the language. This king, moreover, was so impressed with the character of the Romans, as exhibited by the fact that the denarii found in the possession of the freedman were all of equal weight, although the different figures on them plainly showed that they had been struck in the reigns of several emperors. He remained there sometime longer, and brought them acquainted with his own government. He dispatched the embassy in question to Rome, consisting of 4 ambassadors, of whom the chief was Rachia. Strabo gathered many details from the ambassadors. Taprobana contained 500 towns and villages, and that there was a harbor that lies facing the south, and adjoining the city of Palaesimundus, 10 the most famous city in the isle, the king’s place of residence, and containing a population of 200,000. There was a lake in the country called Megisba, 375 miles in circumference, from which one river called Palaesimundus, ran by the capital of that name, by 3 channels, the narrowest of which was 5 stadia in width, the largest 15; and the other, Cydara by name, northwards towards the coast of India. There were corals, pearls, and precious stones; the soil was fruitful; life was prolonged to more than a hundred years; there was a trade with China overland. The king wears the costume of Father Liber. Their festivals are celebrated with the chase, the most valued sports being the pursuit of the tiger and the elephant. The lands are carefully tilled; the vine is not cultivated there, but of other fruits there is great abundance. They take great delight in fishing, and especially in catching turtles; beneath the shells of which whole families find an abode, of such vast size are they to be found. The mode of trade and barter among the inhabitants themselves was peculiar, being done at night. The country and people were maritime and highly commercial. These ambassadors made one statement of the country enjoying two summers and two winters, which clearly show that the country embraced on both sides of the equator. The inhabitants, who lived a hundred years, spent most of their time in hunting tigers and elephants, and fishing, especially catching turtles, whose shells were so enormous habitations were made of them. The ambassadors expressed great surprise at seeing the northern stars, and the sun rise on the left and set on the right hand. The nearest point of the [Greater] Indian coast was a promontory known as Coliacum, distant 4 days’ sail, and midway between them lay “the island of the Sun”; the sea was a greenish tint, having numerous trees (coral) growing in it, which the rudders of vessels broke off as they came in contact when sailing over it. The sea that lies between the island and the mainland is full of shallows, not more than 6 paces in depth; but in certain channels it is of such extraordinary depth, that no anchor has ever found a bottom. For this reason it is that the vessels are constructed with prows at either end; so that there may be no necessity for tacking while navigating these channels, which are extremely narrow. The tonnage of these vessels is 3,000 amphorae. In traversing their seas, the people of Taprobana take no observations of the stars, and indeed the Greater Bear is not visible to them; but they carry birds out to sea, which they let go from time to time, and so follow their course as they make for the land. They devote only 4 months in the year to the pursuits of navigation, and are particularly careful not to trust themselves on the sea during the next 100 days after the summer solstice, for in those seas it is at that time the middle of winter. Ptolemy, referring to Taprobana, states that its name had been altered to Salike. While Pliny gives very few names of places in Taprobana, Ptolemy, on the contrary, supplies a mass of information concerning the island, which is surprising by its copiousness, including not merely a complete periplus of its coasts, with the names of the headlands, rivers, and seaport towns, but also the names of many cities and tribes in the interior. The Periplus Maris Erythraei (or “Voyage around the Erythraean Sea”), an anonymous work from around the middle of the first century AD written by a Greek speaking Egyptian merchant, indicates that the course trending toward the east, lying out at sea toward the west is the island Palaesimundu, called by the ancients Taprobana. The northern part is a day’s journey distant, the southern part trends gradually toward the west, and almost touches the shore of Azania. It produces pearls, transparent stones, muslins and tortoise-shell. 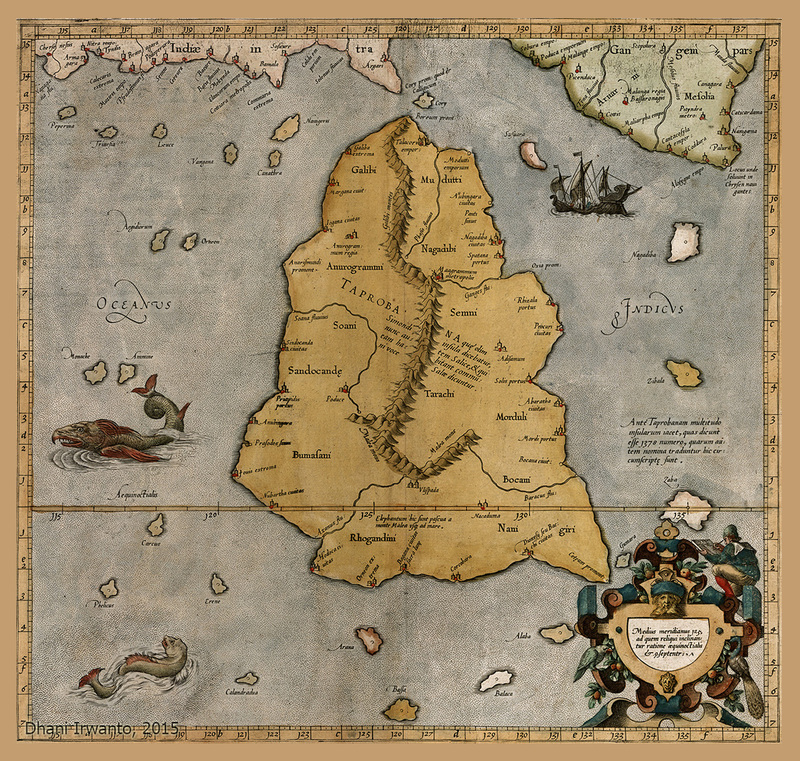 Cosmas Indicopleustes (Cosmas the Indian Voyager), who wrote The Christian Topography in the early 6th century, took especial care several times to impress it on his readers that the island called Serendib by the Indians was the Taprobana of the earlier Greeks. In the time of Cosmas the name Taprobana had vanished. From the BC until the Middle Ages followed by the New World, a wide variety of world maps had been created and can be observed, which shows the development of the Western knowledge about the whole Earth, from the simple to the almost complete. The development was driven by the need for more accurate maps of trade routes heading to the world in the east, known as “The Silk Road”, that is from the Mediterranean Sea, followed by the Red Sea, the Erythraean Sea, the Indian Ocean, and ending in China. At the early century, only that trade route was the most widely known, while outside those regions only little information obtained that were from sailors who had visited them. Kalimantan Island is outside that route so that the location was not exactly known, or possibly deliberately kept in secret because this island has lucrative resources with superior quality that are very alluring for trade commodities. 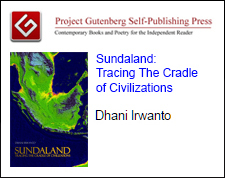 These become the subjects of the author to hypothesize that Taprobana is actually Kalimantan. The island of Taprobana is shown on the maps of Dicaearchus (300 BCE), Eratothenes (220 BCE), Strabo (18 CE), Pomponius Mela (43 CE), Ptolemy (150 CE), Al-Idrisi (1154 CE), Martellus (1490 CE), Cantino (1502 CE), Caverio (1505 CE), Waldseemüller (1507 CE), Lorenz Fries/Peter Apian (1520 CE) and edited Ptolemy’s by Lorenz Fries (1522 CE), while the Middle-Age maps by Abraham Ortelius (1570 CE) and after that do not show. Maps prior to Ptolemy are without advancement of geography and cartography, so that information on maps are rather sparse, so generalized and far from accurate. Geographic features were drawn as they saw them or as travelers and explorers described them. As begun by Dicaearchus in the 3rd or 4th century BCE, Taprobana is shown, on the world map – as what they heard from what they saw or described by other travelers – in the Indian Ocean without knowing the exact position, at the south, west or further west of the Indian Peninsula. 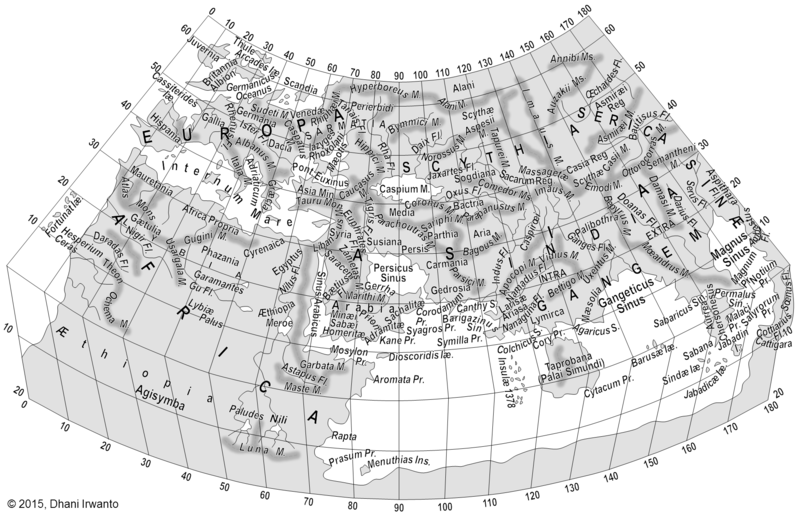 Ptolemy’s map shows the whole world from the Fortunat Insulae eastward to China, spanned 180 degrees of longitude and about 80 degrees of latitude. His book Geographia carries a list of the names of some 8,000 places and their approximate latitudes and longitudes. The greater number of these locations are determined from older maps (Strabo, Eratosthenes, Herodotus, Hesiod and Hecataeus), with approximations of distances and directions taken from travelers and more accurate mapping of both Philo and Josephus 100 years earlier, except for a few that were made by observations. Ptolemy is well aware that he knows about only a quarter of the globe and can not do more as the available data was of very poor quality for anything outside the Roman Empire. These make the maps given by Ptolemy are inaccurate in many places. If we look his world map and compare it with the modern map, we can clearly see the tremendous deviations, much largely in the Asian portion. His error of underestimation of the size of the Earth is another contribution of the inaccuracy. 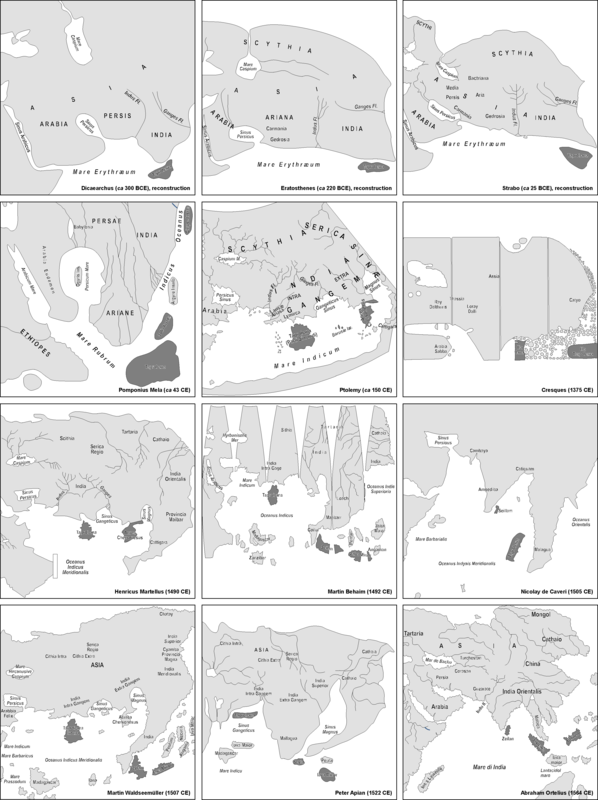 Ptolemy also includes 26 regional maps and 67 maps of smaller areas. These maps are at the grater located in and around the Roman Empire, with only a few regional maps are in the Greater India and China, where among them is Taprobana. These regional maps and smaller area data are of better accuracy, whether they are obtained from his observations or data from other travelers or explorers. Incorporating these regions and areas on an inaccurate world map derived from the older maps creates his confusions to locate their exact positions. Allegedly, he locates Taprobana based on the older maps of whether Eratothenes or Strabo, that actually no such island is in the position, or he deliberately puts it in the wrong place or floats its location so that not everyone can get there. 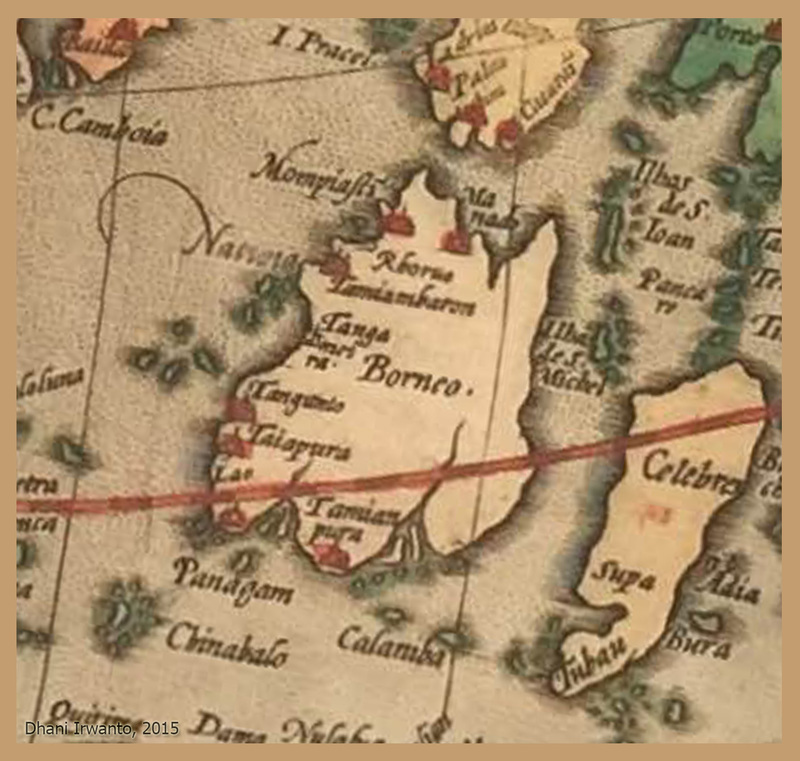 However, so far ahead of their time, they were used well into the Renaissance until 13 centuries later Christopher Columbus underestimated the distances to Cathay and India. With the fall of Constantinople to the Ottoman Turks in 1453, the land route to Asia became much more difficult and dangerous. 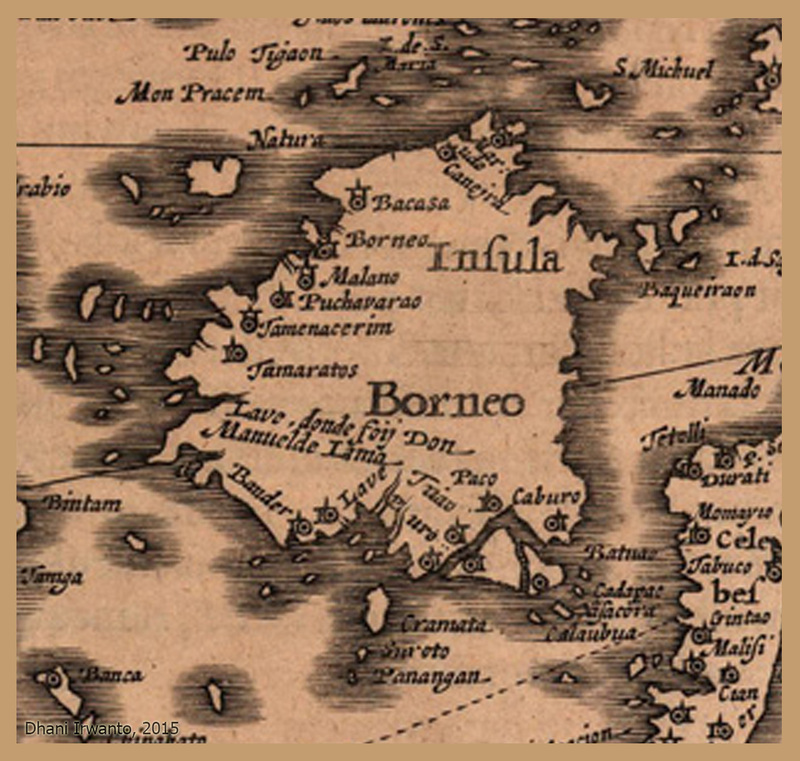 This resulted in a lack of information of the area encompassed by the Indian Ocean, until the Portuguese explorers developed a passage to Asia by sailing around Africa and with the conquest of the Sultanate of Malaka in 1511. Thus, the Asian portion of the world maps after Ptolemy still continues to rely on his information found in the Geographia, incorporates the knowledge obtained from the Arab explores and unknown sources, as shown on the maps of Al-Idrisi, Martellus, Cantino, Caverio, Waldseemüller, Fries and Apian. Al-Idrisi incorporates the knowledge of Africa, the Indian Ocean and the Far East gathered by Arab merchants and explorers. 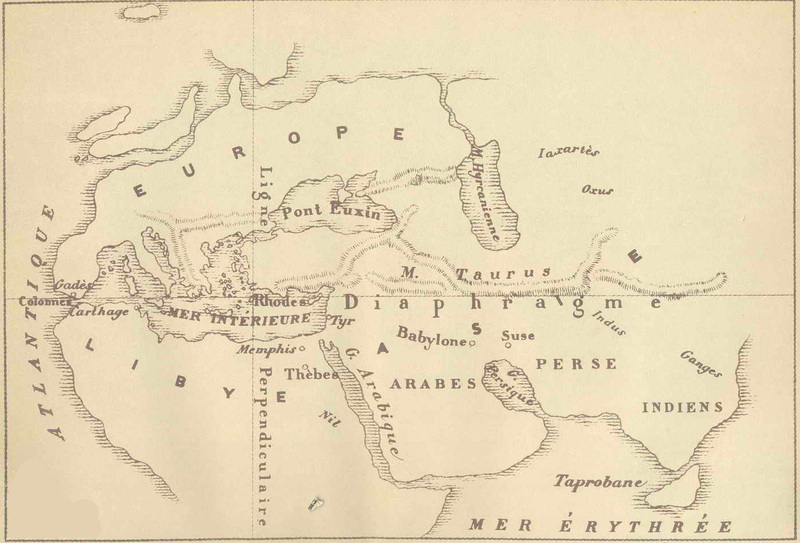 Martellus’ map shows heavy influences from Ptolemy but incorporates Africa. Cantino’s map portrays Brazilian coast and depicts African coast of the Atlantic and Indian Oceans with a remarkable accuracy and detail. Caverio’s map shows the east coast of North America with surprising detail where its sources are still a mystery. Waldseemüller’s map is a new line of editions of Ptolemy’s Geographia with the integration of new geographical information coming from the earliest of voyages of discovery. Fries and Apian’s maps are the re-working of the Waldseemüller’s map. Most of these maps locate Taprobana more or less on the same position as Ptolemy’s map, except Cantino and Caverio’s maps which portray it as Sumatera. Observing and comparing Ptolemy’s and Martellus’ maps, we can clearly see that there were confusions in mapping the Indian Peninsula. Ptolemy describes it in two major regions, India Intra Gangem – where there are Laricæ, Ariasa and Lymirca – in the west that does not show a major protruding peninsula, and India Extra Gangem – where there is Aurrea Chersonesus – in the east that shows a major protruding peninsula. He maps Indus and Ganges rivers on the west and east of India Intra Gangem, respectively, and Magnus Sinus and Cattigara on the further east. Martellus adds another peninsula on the east – where there is Cattigara – based on Ptolemy’s data, and keeps the others similar to Ptolemy’s. 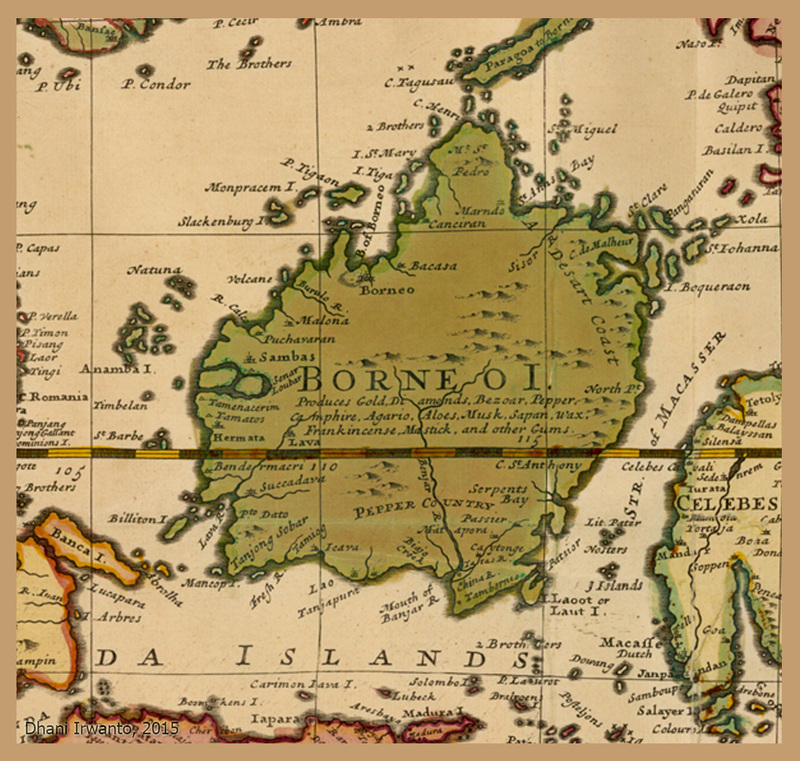 This peninsula is supposedly the Malay Peninsula so that the Indian Peninsula should be the Ptolemy’s India Extra Gangem. Maps thereafter by Cantino, Caveri, Waldseemüller, Fries and Apian confirm this. The Mela and Caveri’s map show two separate islands depicting Sri Lanka (“Solis”, “Seillam”) and Taprobana. 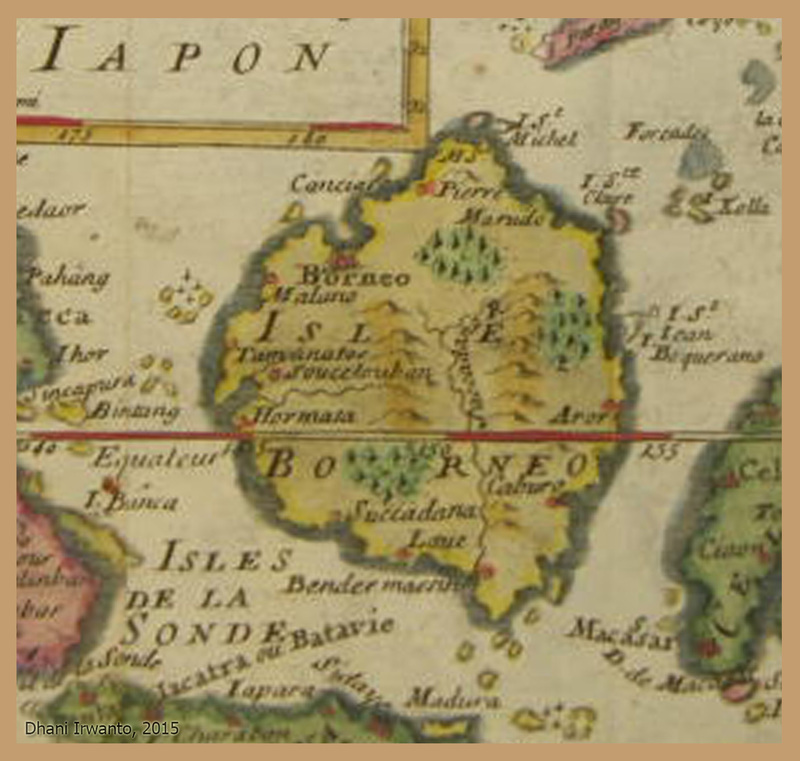 The Ptolemy’s map show Barusæ, which is the present day Barus where it is located in Sumatera, and Taprobana separately. The Behaim, Waldseemüller, Fries and Apian’s maps show Sri Lanka (“Seilan”, “Seillam”, “Seyla”) and Sumatera (“Jaba Minor”, “Iava Minor”), beside Taprobana which is situated further west. These become indications that Taprobrana is not Sri Lanka nor Sumatera, and raise a presumption that it deliberately put on the wrong place or floated its location to make it a secrecy. 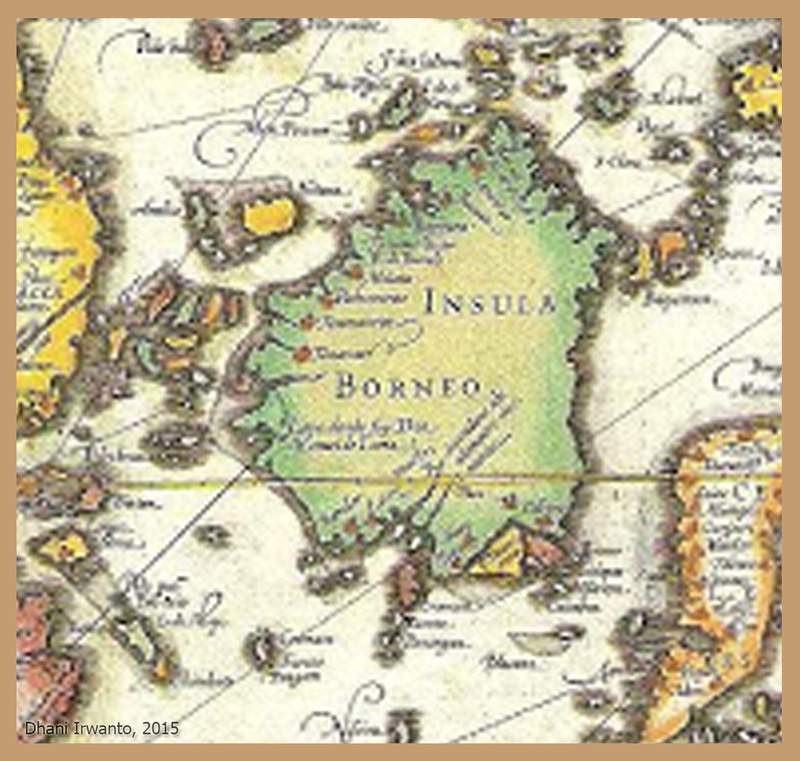 It is allegedly that sailors tried to find Taprobana using Ptolemy based maps could not find it in the location but then sailed further, at the end they found Sumatera and assumed it as Taprobana. In spite of those, Taprobana is shown in the extreme southeast corner (Southeast Asia) on the Cresques’ Catalan Atlas (“Trapobana”), and in the Indian Ocean northeast of Java (“Argeria”) and Sumatera (“Crisa”) on the map of Walsperger (“Tapbana”). 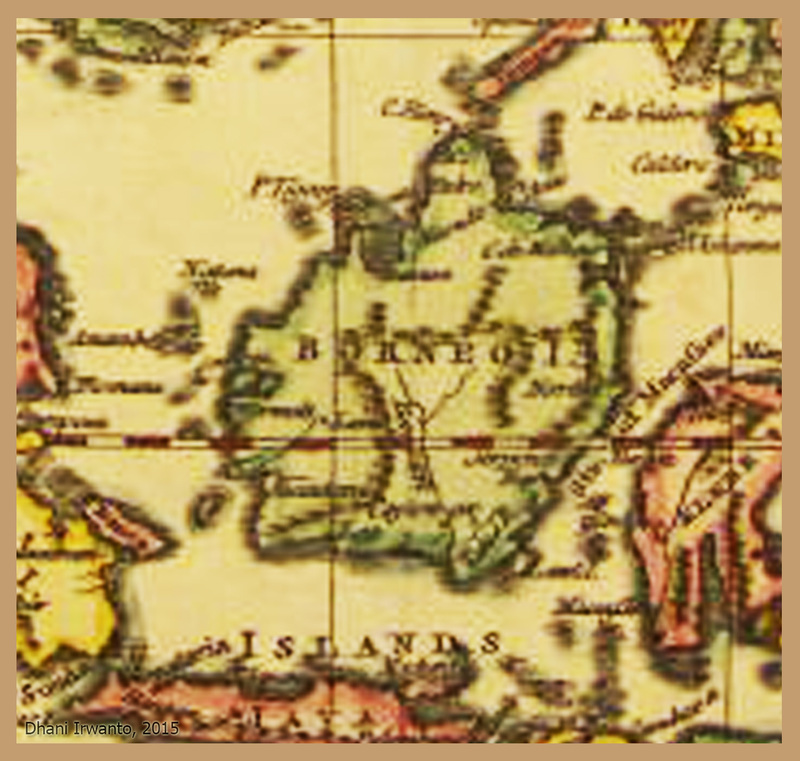 Sri Lanka (“Zeilan”) and Sumatera (“Sumatra”) appear on the Ortelius’ map, but Taprobana disappears, and Kalimantan (“Burneo”) and other islands in the archipelago are added. Thus, it shows the incredibly improved knowledge of the cartographers in that time. 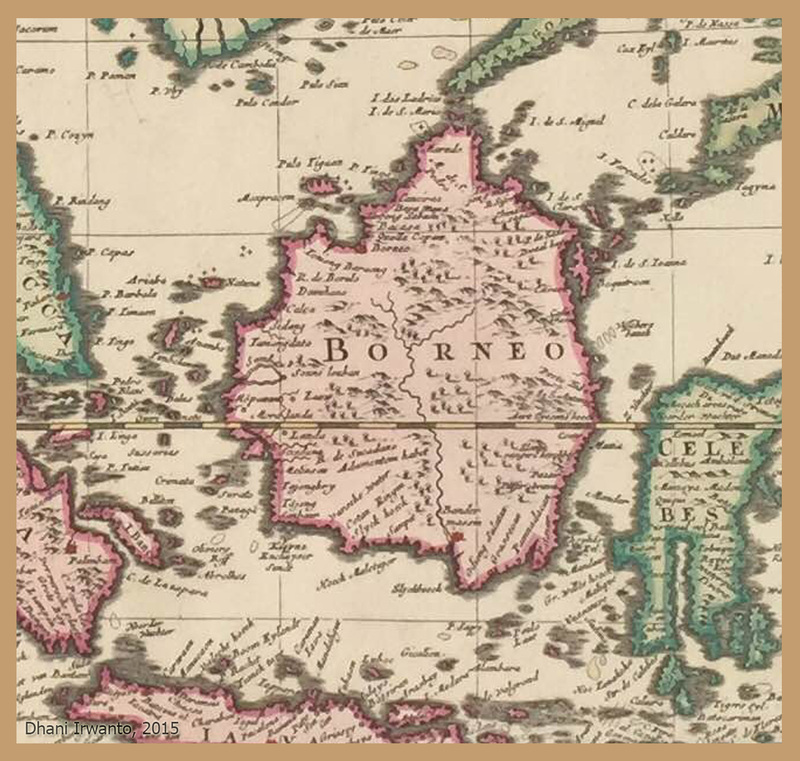 A presumption raise that the knowledge of the archipelago have been understood since that time, and the cartographers should have found out that Taprobana is actually Kalimantan, making it disappear from the maps. Eratosthenes mentioned that Taprobana is located in Eastern sea, lies extended opposite to Greater India. He gave the dimensions of the island, as being 7,000 stadia (≈ 1,300 km) in length, and 5,000 (≈ 925 km) in width. 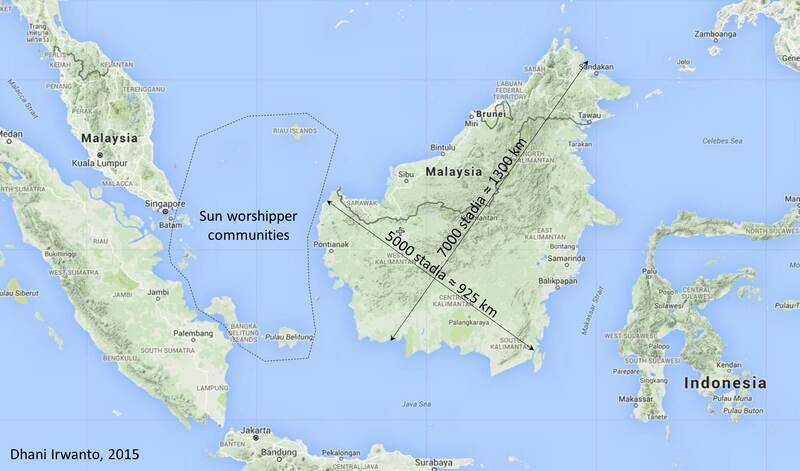 When we measure the size of Kalimantan Island, we can find that these dimensions are highly accurate. The ambassadors dispatched to Rome, as written by Pliny and Strabo, made one statement of the country enjoying two summers and two winters, which clearly show that the country embraced on both sides of the equator. These become evidence that Eratosthenes, Pliny and Strabo are correct to refer Taprobana as Kalimantan. Pliny and Strabo stated that the nearest point of the Greater Indian coast was a promontory known as Coliacum, distant 4 days’ sail, and midway between them laid “the island of the Sun”. The sea was a greenish tint, having numerous coral at the bottom, which the rudders of vessels broke off as they came in contact when sailing over it. 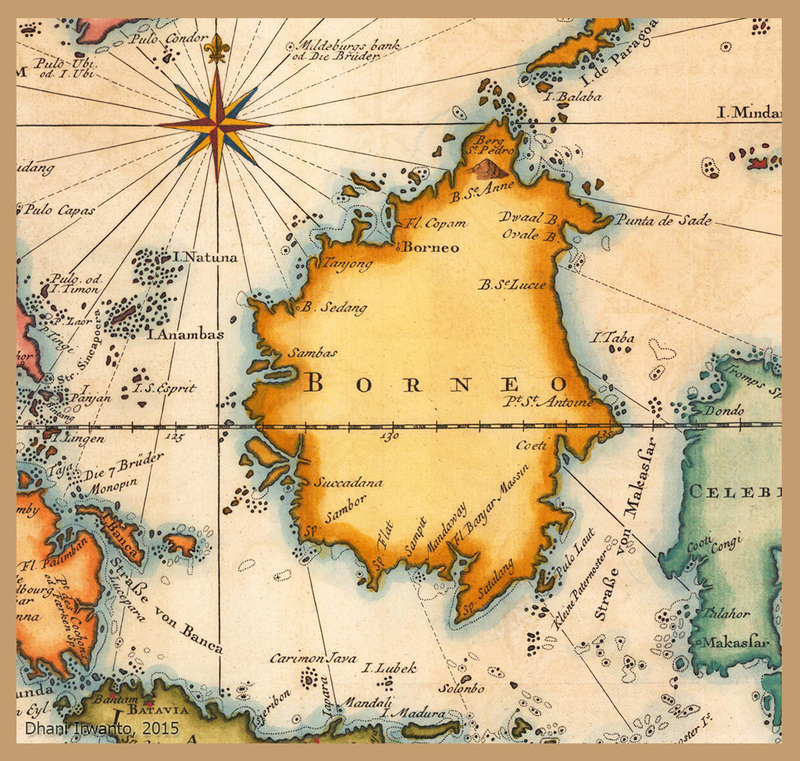 The Coliacum promontory is allegedly the Malay Peninsula, probably they gave its name referring to Kelantan or its older name Kalantan located in east coast of the peninsula. The early history of Kelantan traces distinct human settlement dating back to prehistoric times, and became an important center of trade by the end of the 15th century. 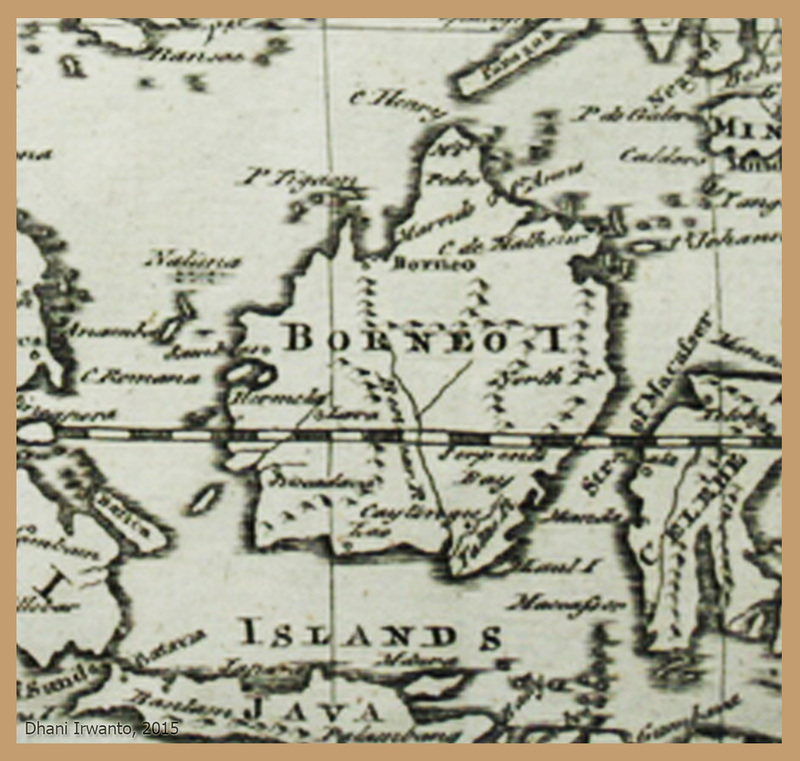 Between Kalimantan and the Malay Peninsula lays the Karimata Strait, a shallow water which was a land mass during the Ice Age. Almost a hundred of islands and coral reefs are in this strait – administratively under the Riau Islands and Bangka-Belitung Provinces of Indonesia – with main islands among them are Natuna, Anambas, Bintan, Lingga, Bangka and Belitung. People in these islands are famous for their sun worshiping. The sea is shallow and reefs are on the bottom so that its color is greenish. There are several islands around the Kalimantan Island. Those in the Java Sea and Karimata Strait, where they have shallow depth of about 20 to 50 meters, are a mix of real islands and coral reefs. In between islands or reefs, the depths are even shallower so that vessels have to be carefully prepared for such condition. These confirm Pliny’s and Strabo’s statements. The Dayak people inhabiting the Kalimantan Island are mostly hunters and farmers. Their leaders wear clothes and accessories just like Father Liber, as what Pliny and Strabo said. They have also the most ancient tradition of tattooing. Animals are abundant and the soil is fertile. The island is also rich of metal minerals such gold, silver and copper, and any kinds of precious stones. Oysters producing pearls are cultivated in the seas around the island, now become 40% of the world supply of pearl. Elephants, tigers and turtles were abundant in the island as depicted by the Dayak traditions, languages and legends of how they aware of the habitat and habits of these animals, but because of their tradition of hunting these animals, their present populations are dwindled or extinct. Indonesia was the place of the ancient Stegodon, a large size elephant-like animal. DNA Analysis indicates that Asian elephants are native to Kalimantan (Fernando et al, 2003). The now endangered Kalimantan pigmy elephants (Elephas maximus borneensis) are what remained in Kalimantan now, the same species in Java is already extinct some 200 years ago. Kalimantan, as well as Sumatera, are the habitat of giant turtles (Orlitia borneensis) and clouded leopards (Neofelis nebulosa). These facts confirm Pliny’s, Strabo’s and Ptolemy’s statements. In daily life, helmeted hornbills (Rhinoplax vigil) are admired by the Dayaks in Kalimantan, for the lessons the community can learn from the behavior of the species. Using many different reverential names for the birds, the Dayak have many myths and legends in which hornbills are envoys of the gods with the task of conveying divine messages. In their beliefs, the birds give living examples of fidelity to a spouse and responsibility for family life. The Dayak teach their children not to hurt or kill the sacred birds. Such deeds are a taboo. Pliny and Strabo said that in traversing their seas, the people of Taprobana take no observations of the stars, but they carry birds out to sea, which they let go from time to time, and so follow their course as they make for the land. These birds were apparently the hornbill admired by the Dayak. Pliny and Strabo stated that the island had a harbor at the south coast, adjoining the city of Palaesimundus. There was a large lake named Megisba from which Palaesimundus River ran by the city by 3 channels each having width of between 5 and 15 stadia (about 925 and 2775 meters), and the Cydara River laid north of the lake. These three rivers were allegedly the Barito, Kapuas-Murung and Kahayan Rivers. Barito River is nearly 3 kilometers, Kapuas-Murung River is about 1 kilometer and Kahayan river is about 1.5 kilometers in width, in those parts near the sea, that show cnformities with those stated by Pliny and Strabo. A large lake was probably formed on the plain region due to occurrence of a large flood from the mountains with higher flow velocity that could erode the upper part of the plain, but the lower part is flat and level so that the velocity was much reduced and the eroded material settled on that place forming a dam and a lake. A shallow lake on a flat plane may vanish only within hundreds of years. The existing condition now is a large swampy region. 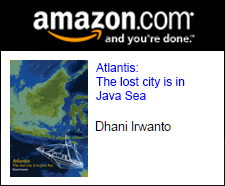 According to the old maps, Tanjungpura located on the south coast of Kalimantan was a prominent city. Several ancient manuscripts mention also this name. Its literal meaning is “the city (pura) of Tanjung tree”. Tanjung tree (Mimusops elengi) is a medium-sized evergreen tree found in tropical forests in South Asia, Southeast Asia and northern Australia. English common names include Spanish cherry, medlar, and bullet wood. Its Sanskrit name is “bakula” so that an ancient manuscript from the Javanese Singasari Kingdom refers the city as Bakulapura. “Tanjung” can also mean “cape” or “peninsula” as used in some place names, but not for this case. In the history records, there was a community near the present Tanjung town named Tanjungpuri. One of the remains is a Hindu temple Candi Agung located in Sungaimalang Village, Central Amuntai Sub-district, Hulu Sungai Utara Regency, South Kalimantan Province. Carbon dating to the remains resulted in around 200 BC. 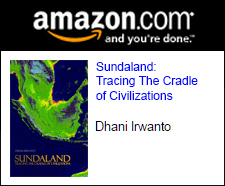 Tanjungpuri was probably the primordial Tanjungpura. 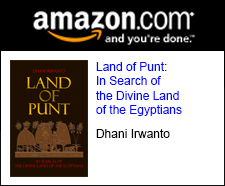 The port of Hippuri mentioned by Pliny was probably Tanjungpuri. At first, the indigenous people of Kalimantan did not apply the kingship system. Their social lives were based on customs and beliefs that were developed and transmitted from generation to generation. The community was formed from a small number of people and an amount of land necessary for living and farming. As the time over, they developed into a larger community that made their customs a more complex, and need more land too. Opening a new land would create a new community so that over time several communities were created but followed the same customs and inhabiting the same region. They called the whole community having the same socio-cultural practices and inhabiting in a region “banua”, meaning “world”, similar to “mundus” in Latin. The communities in Kalimantan strongly hold this “banua” concept until today. Their social leader is called “raja” or “rajah”. The name of the chief of the embassy to Roman as stated by Pliny, Rachia, is probably this “rajah”. 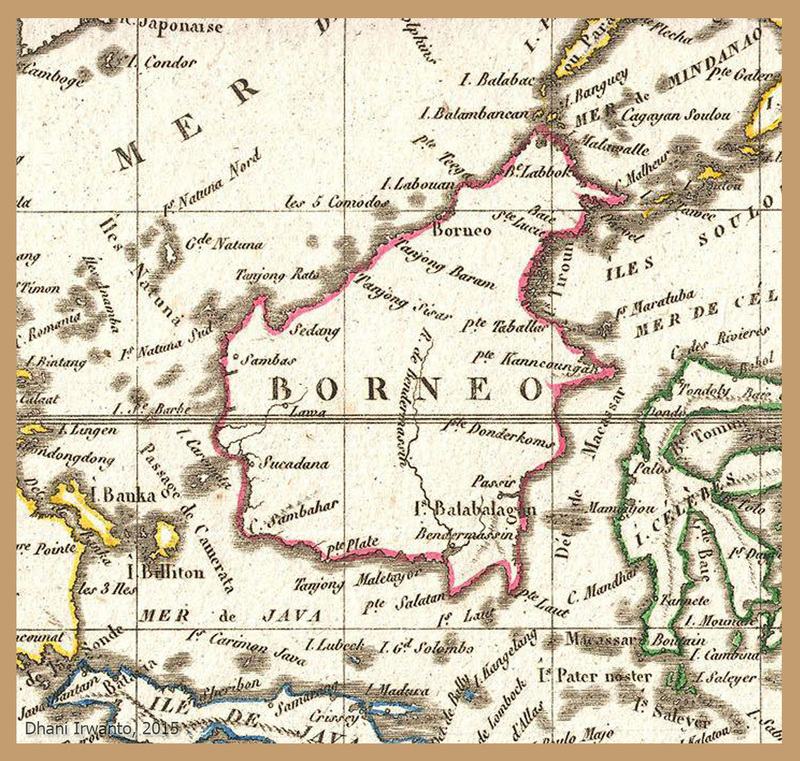 James Brooke was appointed as “rajah”, ruling the territory across the western regions of Sarawak in the 19th century. Kingship was introduced into the indigenous by the Malay settlers from Sumatera around the 4th or 5th century. Tanjungpura was probably a “banua” in the early centuries and BC, so that the long name would be “Banua Tanjungpura”. Some old maps mention it as “Taiopuro”, which probably the European then called it with a long name “Taiopuro Banua”. 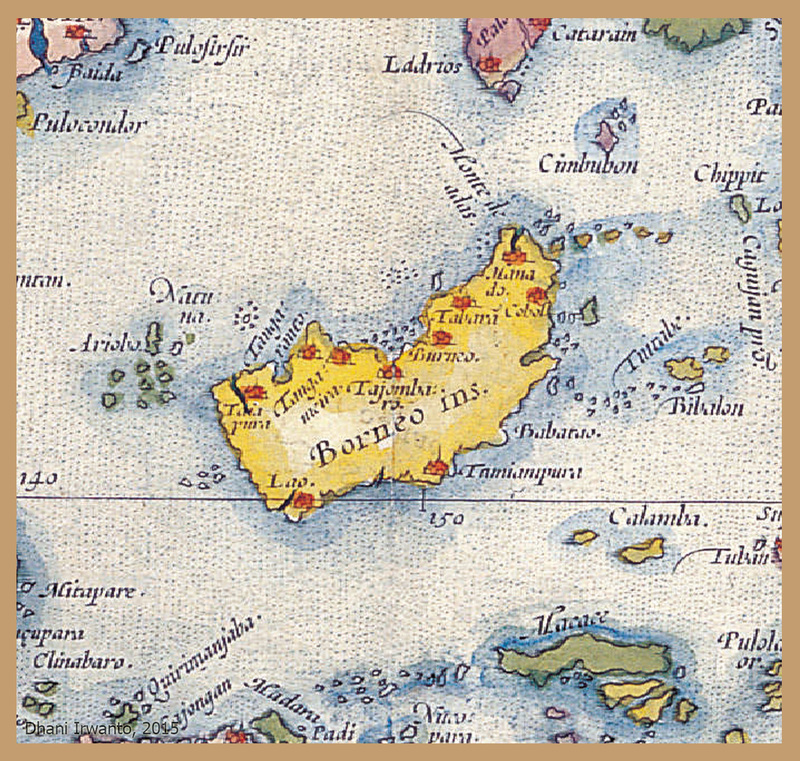 To match the two consonants for each name, it was shortened to “Tapro Bana” and also to name the whole island, the same meaning as “Banua Tanjungpura”. About the name of “Salike” given by Ptolemy, there is an Austronesian word “salaka” that means “white-colored metal”. This is probably a mixture of gold and silver, an electrum. This metal can be found naturally in southern Kalimantan region as a byproduct of gold mining. The word is applied to a cape name, Tanjung Salaka, located at the south coast of Kalimantan almost around the location of Tanjungpura. The freedman Annius Plocamus was possibly stranded around the present-day Banjarmasin, in accordance with his statement that on the southern coast of Taprobana. It was also said that its territory was divided into two separated by a river. One part was infested by wild beasts and elephants, and the other inhabited by Prachii colonists, and producing gold and gems. 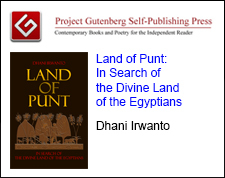 The river was possibly the present-day Barito River and the Prachii colonists was the present-day Banjar people which were inherently colonists in several islands in Indonesia. 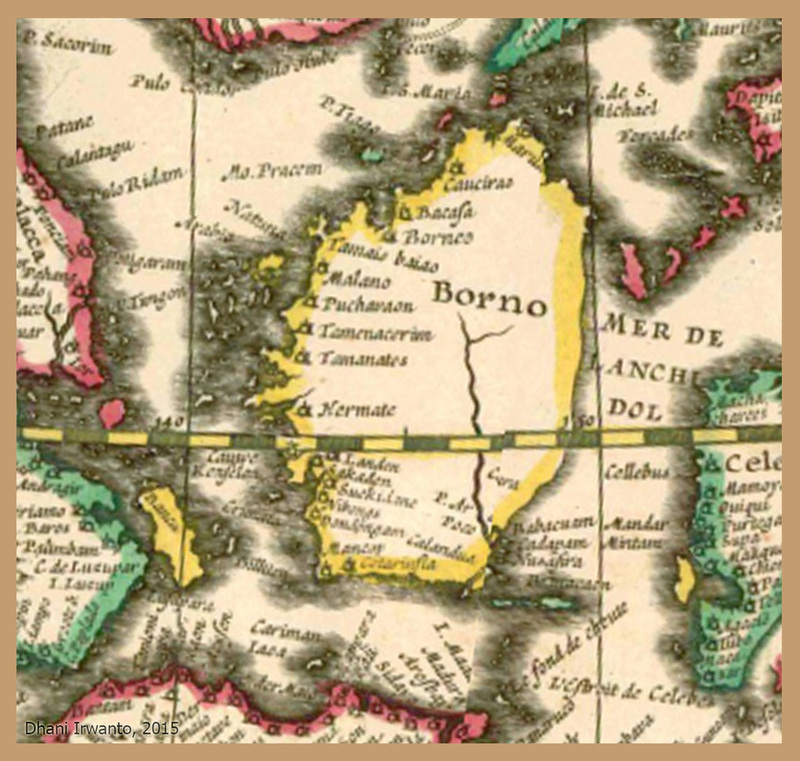 On the ancient maps, the Banjar people were mentioned as Paco, Bancy, Biajo, Bander and Banjar, and by Ptolemy as Bacchi. Banjarmasin by Odoric of Pordenone (an Italian Franciscan friar) was mentioned as Thalamasyn. Banjarmasin by the Roman tongue was changed into Palaesi and added mundus (town) became Palaesimundus. Alexander the Great and the Roman Empire possibly deliberately kept the actual name in secret and obscured it with another names because this island has lucrative resources with superior quality that are very alluring for trade commodities. Besides some other classic names of the island, Kalimantan bore the name of Nusakencana, literally means “the island of gold”, as stated in the Jayabaya Prophecy from the Javanese Kediri Kingdom in the 12th century. The Muarakaman inscriptions found in the upper region of Mahakam River in east Kalimantan dated to 4th century also attest that the king of Mulawarman held a charity of much gold. The word “nusakencana” is an Austronesian language; its translation into Sanskrit is “suwarnadwipa”. Suwarnadwipa is widely known as the island of Sumatera by the historians but there is no such inscription that clearly refers it as the said island, so that other alternative of Suwarnadwipa is Kalimantan as this island is more abundant with gold than Sumatera. Moreover, Cosmas Indico-pleustes mentioned that “Serendip”, a European tongue of “Suwarnadwipa”, was the island of Taprobana. 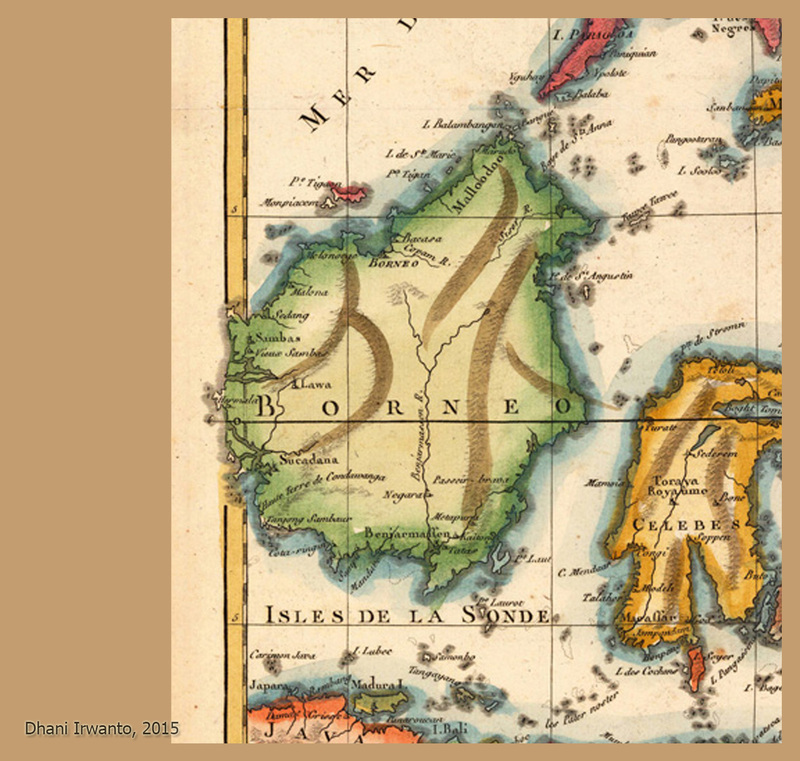 The maps below show the development of Kalimantan maps from the 16th century until the 19th, starting from the map of Abraham Ortelius, which was the first modern atlas. The Ptolemy’s map of Taprobana is also included. 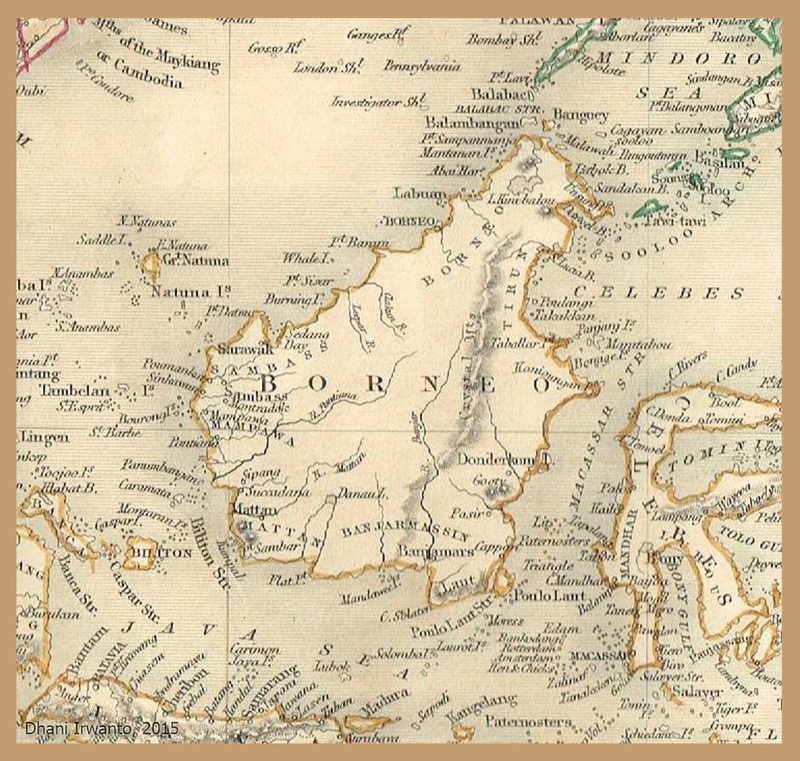 We can see from these maps that the island of Kalimantan took its real map shape just in the middle of 19th century. 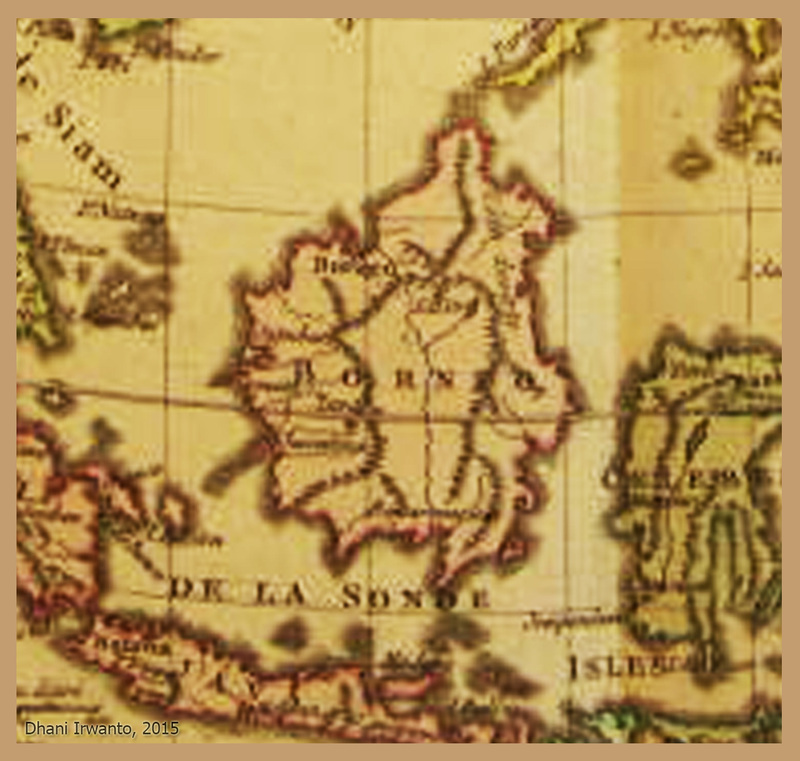 The cartographers of these maps should have known that Kalimantan was actually Taprobana, visible in the great similarities of the geographic names, layout, locations, features and descriptions of the island and its surroundings among Ptolemy’s and their maps. The author identifies the geographic names and locations as mentioned by Ptolemy by correlating with those in the old maps and their modern names. Compass was not invented in the Ptolemy’s time so that the map has very low quality in terms of scale, orientation and geographic locations. Below are the identified names. We can see that numerous names as well as their locations are in close resemblance with those of Ptolemy’s. These are the so many proofs that Taprobana is actually Kalimantan. “Tanjung” means “cape”, “promontory” or “peninsula”. Tanjung Selatan is a significant promontory located at the southeastern part of Kalimantan. Negara was a known place name and frequently mentioned in the old maps, now a village and a river name in South Kalimantan Province. Some maps show Barito River as Banjar River, Banjarmasin River or misplaced as Sukadana River. Mandoemai is mentioned on the 1896 Dutch map. Mandomai is now a village in the region of Kapuas Barat Subdistrict, Kapuas Regency, Central Kalimantan Province. Banjar is an ethnic group in southern Kalimantan and formed a kingdom of Banjarmasin from 1520 to 1860. Banjarmasin is now a capital city of South Kalimantan Province. Some maps show Banjarmasin as Bandarmassin, Bendermassin, Bendermaβin, Bandermachri, Bendarmafsin, Bindermasin, Baniarmafseen, Brandermassin, Banjarmassen, Banjar Massin or Banjarmaffen. Odoric of Pordenone mentioned it as Thalamasyn. Banjar people were travellers; some of them had travelled to many places in the archipelago and set up pockets of settlement. Megasthenes described Taprobana was inhabited by Prachii colonists, this could be the Banjar people. Tanjungpura is a name of an ancient kingdom. 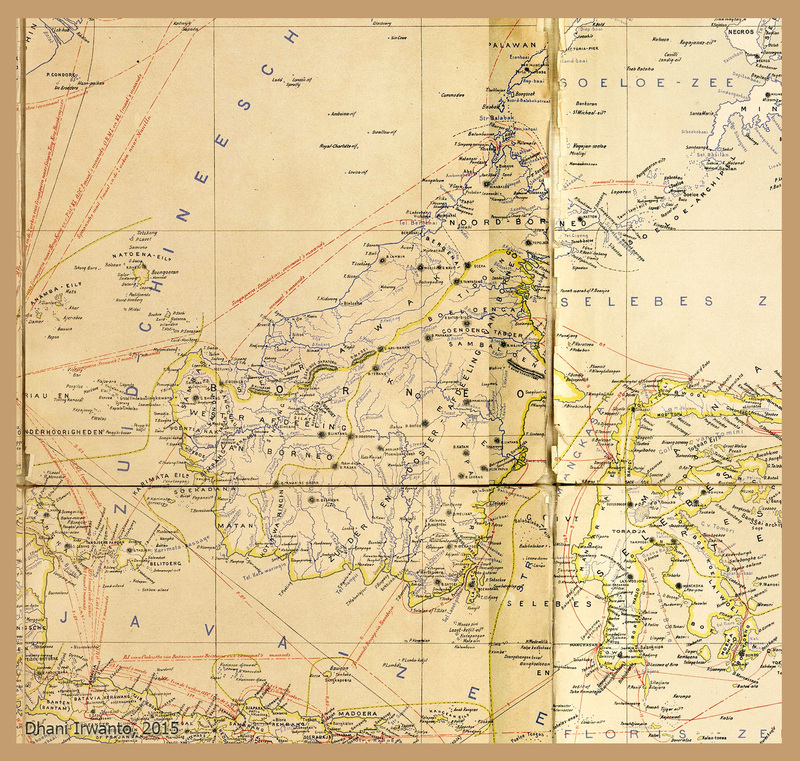 Based on the old maps, its location was not static but mostly at the south and southwest coast of Kalimantan. “Orneo”, “ornis” and “ornêon” in Latin mean “bird”, “fowl” or “heron”. “Bangau” in local language means “hern”, “heron”, “stork” or “egret”. Sebangau is now the name of a river and a bay at the southern coast of Kalimantan. 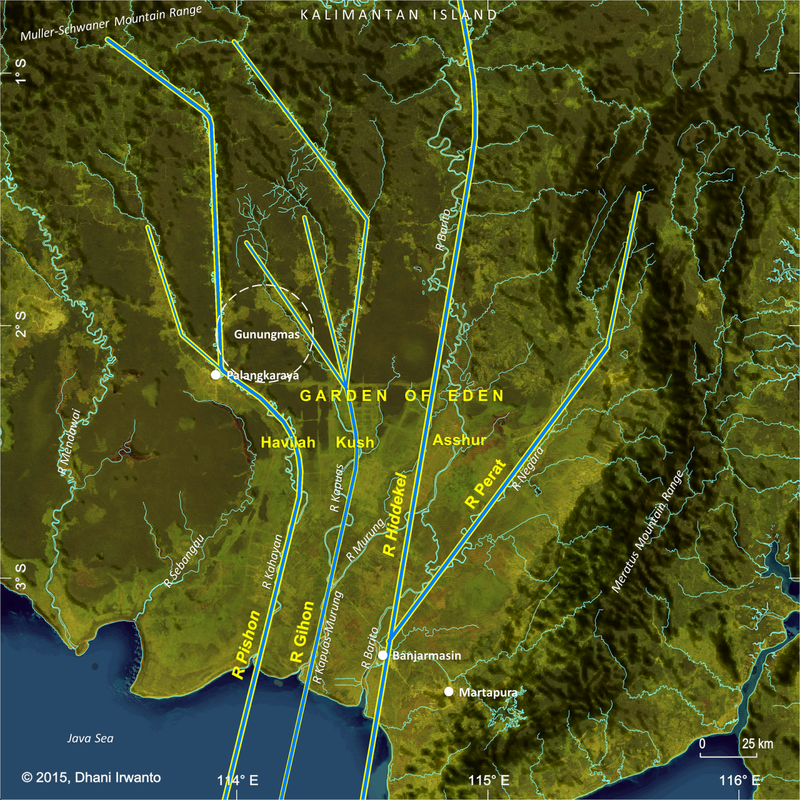 There are several rivers with the name of Kayan (or Kahayan), in western, southern and eastern Kalimantan. Kayan is also the name of several Dayak tribes. Azanus River is probably the Kahayan River in Central Kalimantan. The Periplus Maris Erythraei indicates that the southern part of the region trends gradually toward the west, and almost touches the shore of Azania (or Azanus). Lawi or Lawai is an ancient city in the Ketapang Regency, West Kalimantan Province. The name is frequently mentioned on the old maps but the exact location is controverted. 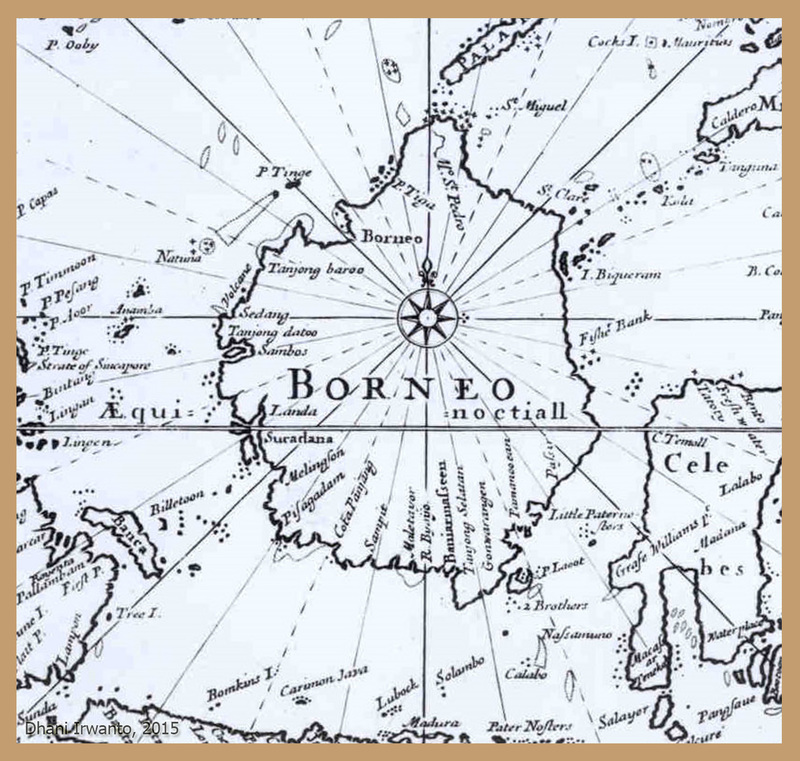 Tomé Pires, a Portuguese explorer, described it as an area rich of diamonds, four-day shipping distance from Tanjompure (Tanjungpura). Lawi is also the name of a river, a tributary of Kayan River. Lawi is sometimes associated with Melawi, a regency in West Kalimantan Province. Tanjung Sambar is a cape in the Muara Kandawangan National Park. Melawi is the name of a regency in West Kalimantan Province, also the name of a river, located and has its headwaters on the Schwaner-Muller, a mountain range with highest peaks in Kalimantan. Ketapang is the oldest town in the western Kalimantan, was once the center of the kingdom of Tanjungpura situated at Matan. Ketapang is the capital of the Ketapang Regency, West Kalimantan Province. Cempedak is now the names of the two islands, off the coast of the port Siduk, Sukadana. 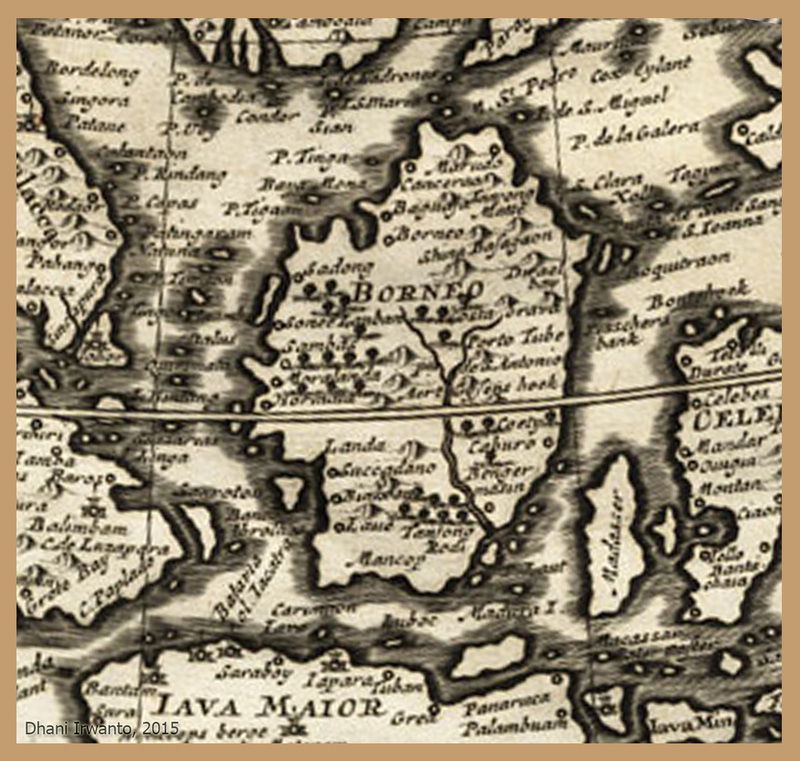 Tamaratos and Hormata are frequently mentioned in the old maps, these are probably the modern town of Ketapang. Karimata is now the name of an island off the coast of Ketapang and a strait separating Kalimantan and Sumatera. Sukadana is frequently mentioned in the old maps, it was an ancient kingdom with its products are diamonds and iron. Sukadana is now the capital city of North Kayong Regency, West Kalimantan Province. Landa is frequently mentioned in the old maps, this is probably Sekadau located at the bank of Kapuas River. Sekadau is now the names of a regency and also its capital, in West Kalimantan Province. The above names are found on the 18th and 19th century maps indicating the three rivers (or places) around the Main Sambas River, literary mean “river” (“sungai”). These are written as Sone Sambas, Sone Luban and Sone Napor, probably the closely neighboured Sambas Kecil, Teberau and Subah Rivers. Sambas was a kingdom from before 14th century to 1950 AD, now the capital city of Sambas Regency in West Kalimantan Province. Anurogrammum is in close resemblance to Anurognathus, a genus of small pterosaur. The indigenous Dayak people are hornbill admirers, have many myths and legends in which hornbills are envoys of the gods with the task of conveying divine messages. The Anurogrammum is allegedly meant “hornbill admirer”, ie the Dayak people. Melanau people are an ethnic group native to Sarawak, the fifth largest group (after Iban, Chinese, Malays and Bidayuh), but forms a large part of Sarawak’s political sphere. The Melanau are considered among the earliest settlers in Sarawak, at first settled in scattered communities along the main tributaries of the Rajang River in Central Sarawak. Miri town is named after a minority ethnic group called “Jatti Meirek” or simply “Mirek”, or “Miriek”. This ethnic group is the earliest settlers in the region of Miri Division, Sarawak. Balabac is the southern-most island of the Palawan province in the Philippines, only about 50 kilometres north from Sabah, Malaysia, across the Balabac Strait. The Molbogs, which is also referred to as Molebugan or Molebuganon are concentrated in the island. 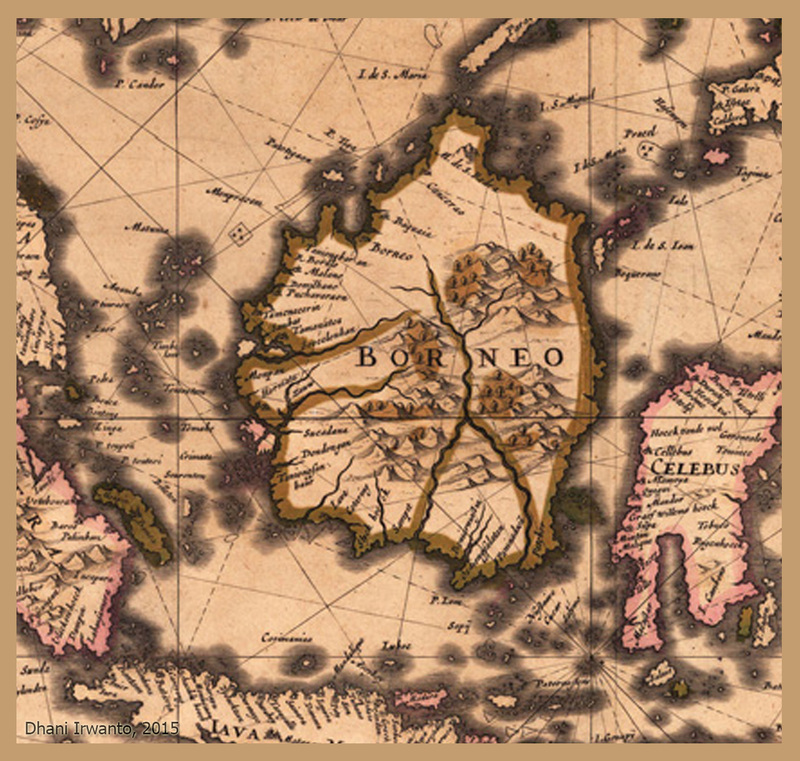 The Molbogs allegedly migrated from North Borneo, related to the Tidung or Tirum people, an indigenous group found in the northeast coast of Sabah since they have similar dialect and socio-cultural practices. 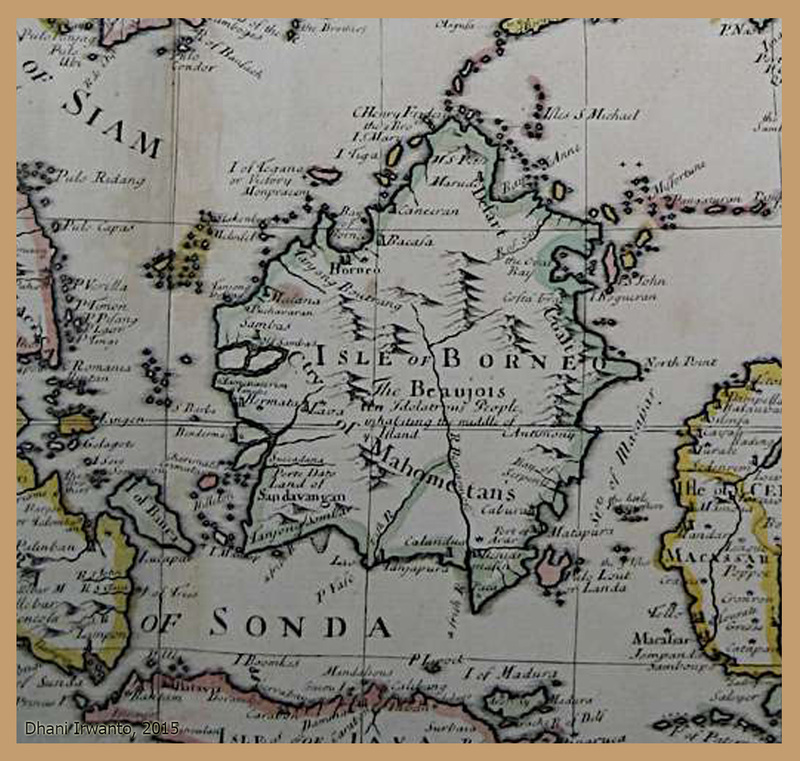 The names of Sabah, Balambangan Island and Teluk Labuk might also be derived from the same name. This place is frequently mentioned in the 17th- and 18th-century maps. The exact place is not known, possibly Keningau, a district in the Interior Division, Sabah. It is the oldest and largest town in the interior part of Sabah. During the British colonial era, Keningau was one of the most important administrative centres in British North Borneo. Other possibility is the town of Kinarut belongs to the Papar District, in the state of Sabah, Malaysia. It was originally belonged to the Sultanate of Brunei. During the Brunei Civil War, Sultan Abdul Hakkul Mubin built a base in Kinarut at a strategic location protected by two rivers and remained there for ten years as the Sultan of Kinarut. Marudu is a town and a district located in the Kudat Division of the state of Sabah. The Murut are an indigenous ethnic group, inhabiting northern inland regions of Borneo, literally means “hill people”. A large percentage of the Murut communities are in the southwest interior of Sabah, specifically the districts of Keningau, Tenom, Nabawan and Pensiangan, along the Sapulut and Padas rivers. The Murut were the last of Sabah’s ethnic groups to renounce headhunting. Kinabatangan River is located in Sabah, the second longest river in Malaysia, its headwaters are in the mountains of southwest Sabah, its outlet is at the Sulu Sea, east of Sandakan. The Lun Bawang (formerly known as Southern Murut) is an ethnic group found in Central Northern Borneo. They are indigenous to the highlands of North Kalimantan (Krayan, Malinau and Long Bawan), Brunei (Temburong District), southwest of Sabah (Interior Division) and northern region of Sarawak (Limbang Division). Negaradipa was a kingdom located in the interior of South Kalimantan. Its capital was originally at Candi Laras, Margasari, near the downstream of Bahan River at its tributary, then they moved to the upstream of the at Candi Agung, Amuntai. As well as some tribes in Borneo, before establishing their empire they were tribal societies. Possibly, Negaradipa was a tribe before establishing their kingdom. The tribes in Kalimantan are generally nomadic and the tribe of Negaradipa was not necessarily located at the kingdom of Negaradipa. Muarakaman, located in Kutai Kartanegara Regency, East Kalimantan Province, is known as the existence of stone manuscripts dated around 4th century AD, written on seven stone pillars in the Pallava alphabet and the Sanskrit language, considered as the oldest inscription existing in Indonesia. A Brahmin (Hindu) kingdom is attested by the manuscripts, located in Muarakaman, precisely in the bank of Mahakam River. There is no inscription that clearly mentions the name of this kingdom, but popularly known as Kutai Martadipura as has been given by the scholars. Several places sacred to Hindus lie along the banks of rivers and named the rivers as Ganges. Mahakam River where Muarakaman is located in its bank was most likely considered as the Ganges. Bontang is a port town in East Kutai Regency, East Kalimantan Province, located at the eastern coast of Kalimantan. The Dayak Paser is an indigenous ethnic group found in southeastern Kalimantan. Dayak Paser people are possibility have alliance with the Dayak Lawangan, a clump of the Dayak Ot Danum. They formed a kingdom namely Sadungaras (later Pasir Sultanate) from the 16th to the early 20th centuries. Paser is now a regency in East Kalimantan Province. Semaras is a place name located in western coast of Laut Island, South Kalimantan Province. Kalambau are islands located off the south coast of Kalimantan in the Java Sea. Administratively, the islands belong to the province of South Kalimantan. Karamian is an atoll island located off the south coast of Kalimantan in the Java Sea. Administratively, the island belongs to the province of East Java. Masalembo are islands located off the south coast of Kalimantan in the Java Sea. Administratively, the islands belong to the province of East Java. Bawean is an island located off the south coast of Kalimantan and northern Java, in the Java Sea. Administratively, the island belongs to the province of East Java. Karimunjawa are islands located off the north coast of Java, in the Java Sea. Administratively, the islands belong to the province of Central Java. Enkhnysen Reef is a group of coral reefs located in Java Sea off the Tanjung Sambar peninsula near Mangkup Island. The Bangka-Belitung Islands are a province lying off Sumatera. The province comprises two main islands, Bangka and Belitung, and several smaller ones. The Bangka Strait separates Sumatera and Bangka, and the Gaspar Strait separates Bangka and Belitung. The South China Sea is to the north, the Java Sea is to the south, and the province is separated from Kalimantan in the east by the Karimata Strait. The Anambas and Natuna Islands are located in the South China Sea, off the northwest coast of Kalimantan. Administratively, the islands constitute a regency within the Riau Islands Province. Tioman Island is an island in Pahang, located off the east coast of the state. Cu Lao Re or Ly Son is an island off the coast of Vietnam in the South China Sea. Pulau Tiga (Tiga Islands) is a group of three small uninhabited islands off the western coast of Sabah, Malaysia that make up Tiga Island National Park. “Orneo”, “ornis” and “ornêon” in Latin mean “bird”, “fowl” or “heron”. Côn Đảo Islands are an archipelago of Bà Rịa–Vũng Tàu Province, in the Southeast region of Vietnam, and a district of this province. 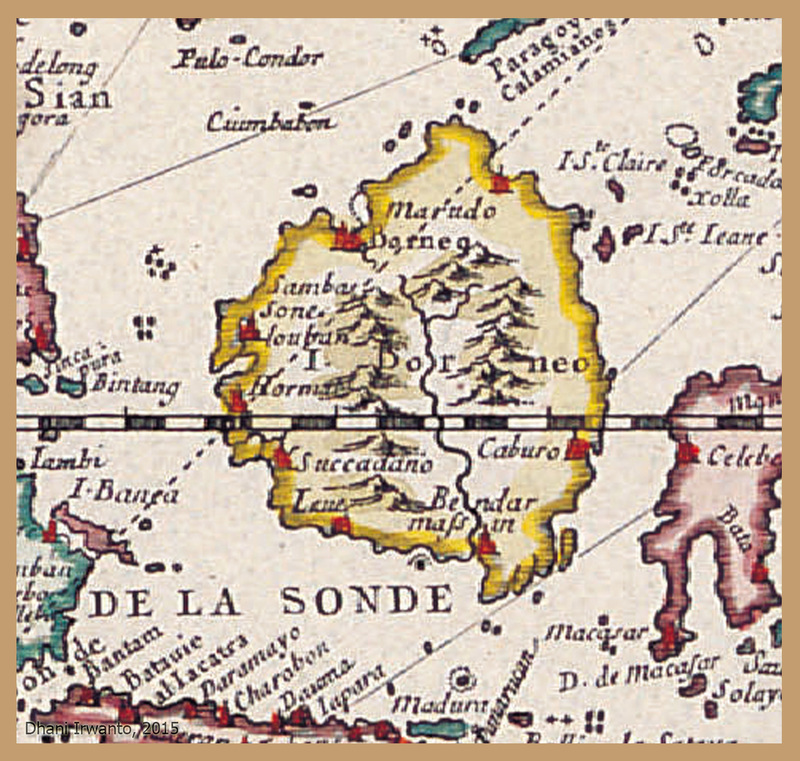 Marco Polo mentioned the islands in the description of his 1292 voyage from China to India under the name Sondur and Condur. The name was interpreted as Condor, the Chinese mythological eagle. Palawan Island is the largest island of the Palawan Province, Philippines. The northern coast of the island is along the South China Sea, while the southern coast forms part of the northern limit of the Sulu Sea. Sibutu is an island in the province of Tawi-Tawi, Philippines. It lies east of the coast of Sabah, Malaysia. Sulawesi is an Island located east of Kalimantan Island. This is the closest large island that can be seen from the eastern coast of Kalimantan. Several maps mention Celebes also as a place name at the west coast of Sulawesi, but the modern name of this place can not be identified. Ptolemy apparently only get one coordinate point on this island so the map drafter drew it as a small island on the map. The Sabalana Islands are an atoll in the Flores Sea, lying just north of the Lesser Sunda Islands, closer to Sumbawa than Sulawesi. Administratively, the atoll belongs to the province of South Sulawesi. 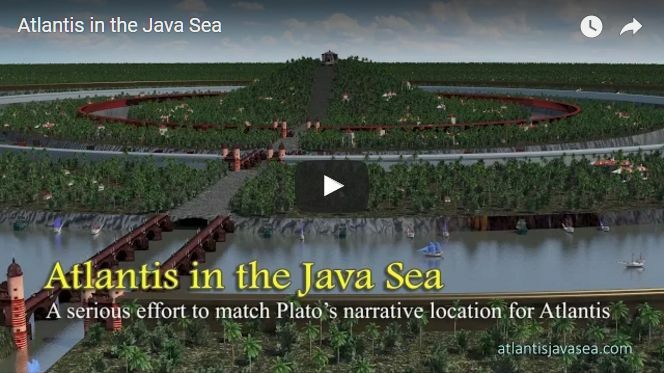 Plato told the story of Atlantis around 360 BC. About 30 years later, Alexander the Great invaded India and Nearchus and Onesicritus who accompanied him on his campaigns described Taprobana for the first time. About another 30 years later Seleucus Nicator sent Megasthenes as ambassador to Sandracottus (Chandragupta Maurya) in 302 BC where Taprobana was also described. The story of Atlantis has been an object of fascination among western philosophers and historians. Of course, Alexander the Great was not lost his attention on the supreme land. Alexander was the student of Aristotle, a student of Plato. The descriptions of Atlantis by Plato were very clear and in details, but the search for Atlantis around the Mediterranean Sea did not return any results. It can be presumed that Alexander thought that Atlantis was not in the area but in Far East, in the Indian Ocean. 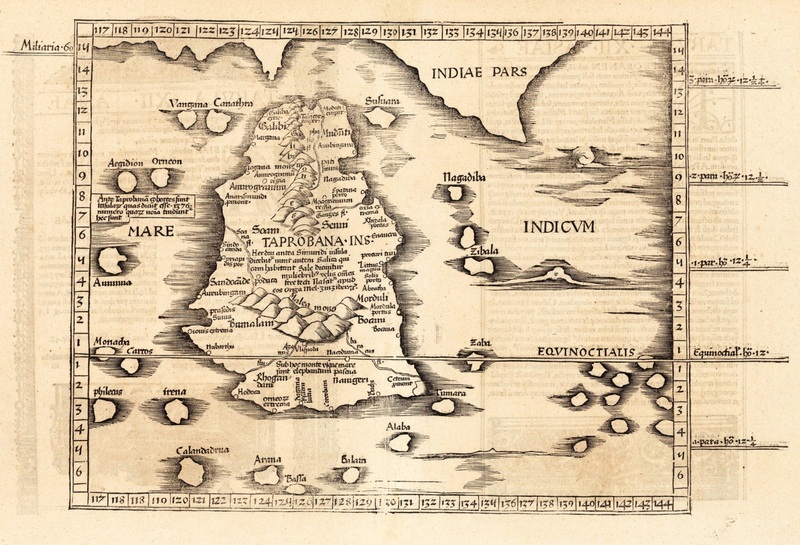 During his invasion to India, Atlantis was allegedly discovered, but this discovery was kept into confidential and obscured with other name, Taprobana by Nearchus and Onesicritus, including its location. His conquering for India was defeated by Chandragupta but an alliance was formed. After his death, Seleucus continued the alliance and the secrecy of Atlantis and Taprobana were still kept. Megasthenes described Taprobana in a little more detailed. In the reign of Claudius, four people from the island of Taprobana were dispatched as embassy to the Roman. Again, Claudius and the former emperors should not have lost his attention about Atlantis. Being described very clearly and in details, he could think that Taprobana was part of the Atlantis. The following emperors should know that Taprobana was part of Atlantis but they kept on continuing the secrecy. Taprobana was spoken by some writers during this time. In the reign of Antoninus Pius (138 – 161 AD), Taprobana was mapped in details by Ptolemy. Again, the Roman Empire possibly deliberately kept the location in secret and obscured it. The last part of Critias, a Plato’s dialogue, which allegedly describes more detailed information about Atlantis have been lost. The original maps of Ptolemy were also lost, an indication that they wanted to hide. In the 6th century AD, the name Taprobana had vanished. After the fall of Rome, European geography entered a dark age more profound than that of most other disciplines, and facts about Taprobana and Atlantis were buried. Many ancient books and scholarly works, especially those housed at the Library at Alexandria, was lost for over a thousand years. At the end of the 1400s, Plato and Ptolemy’s works were rediscovered; Atlantis and Taprobana became popular once again. 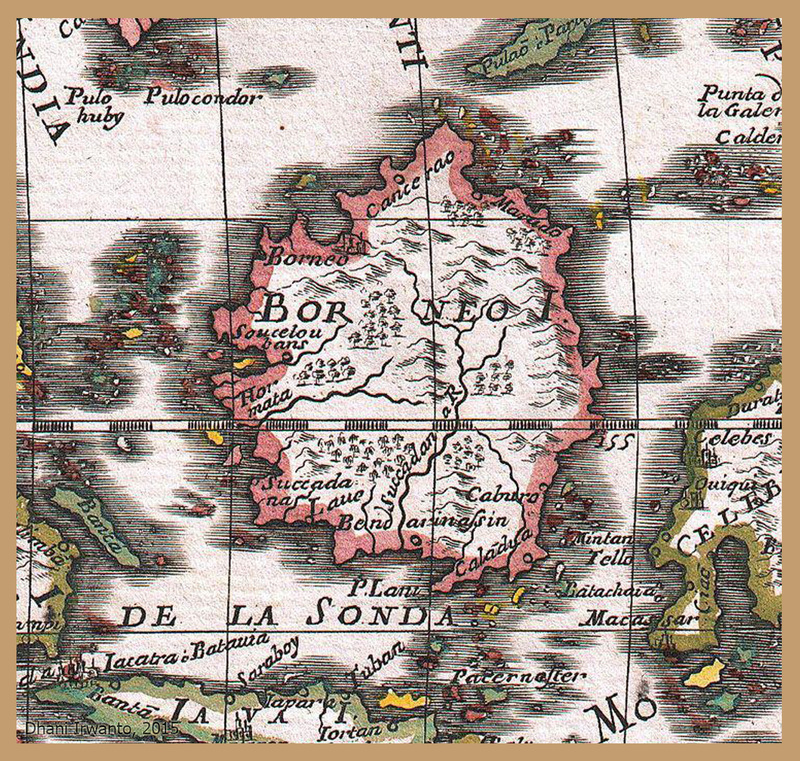 The Western colonialization in Asia involving Britain, France, Portugal and the Netherlands was allegedly inspired by the allurement of Taprobana as well as Atlantis. This was sparked early in the 15th century by the search for trade routes to the Far East that led directly to the Age of Discovery, and the introduction of early modern warfare. By the early 16th century, the Age of Sail greatly expanded Western European influence and development of the Spice Trade under colonialism. 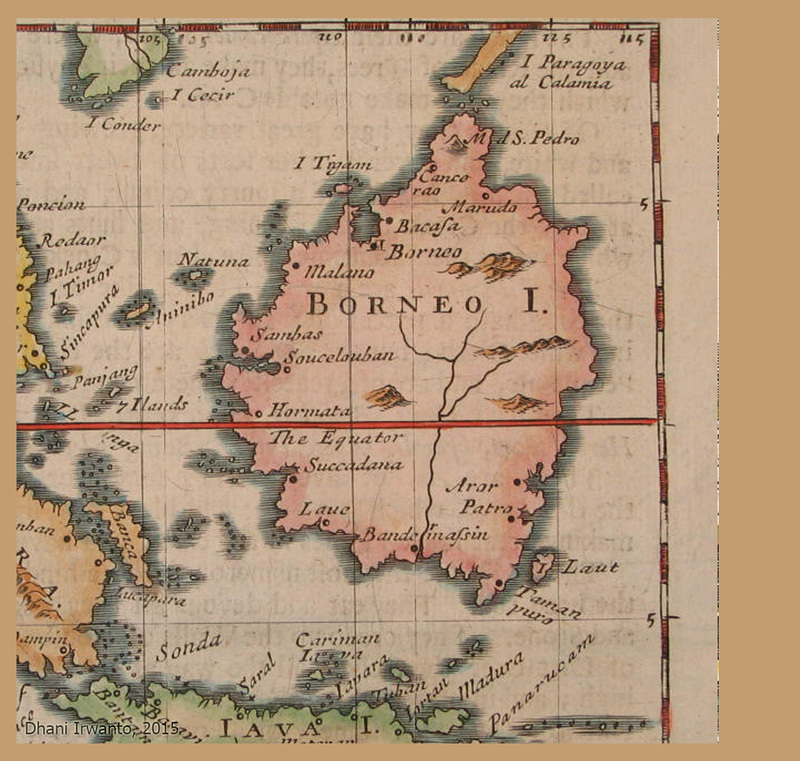 The cartographers of this era should have known that Taprobrana is Kalimantan, visible in the great similarities of the geographic layout, locations, features, names and descriptions of the island and its surroundings among Ptolemy’s and their maps. Hyang or personified as Sang Hyang (Kawi, Javanese, Sundanese and Balinese) is an unseen spiritual entity that has supernatural power in ancient Nusantara mythology. This spirit can be either divine or ancestral. In modern Nusantara this term tends to be associated with gods, dewata or God, widely associated with Indonesian Dharmism developed in ancient Java and Bali for more than a millennium ago. However this term actually has an older origin, it has its root in indigenous animism and dynamism beliefs of Austronesian people that inhabit the Nusantara archipelago. 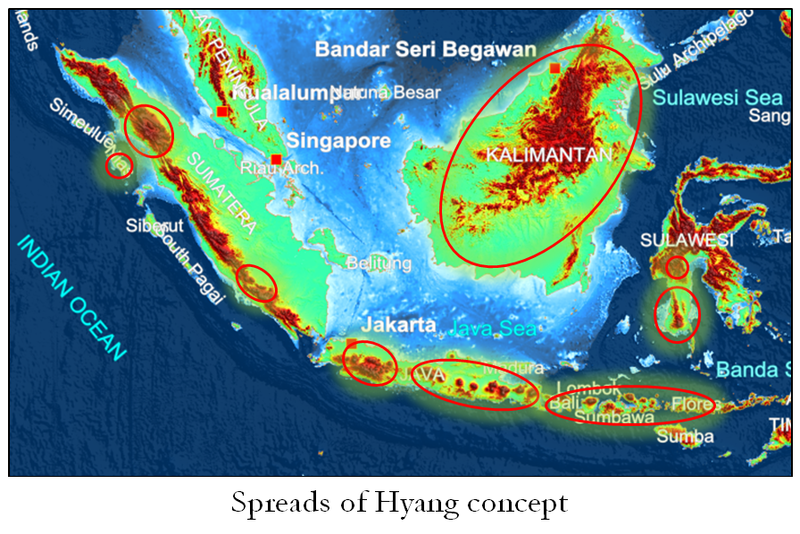 The Hyang concept is indigenously developed in archipelago and considered not originated from Indian dharmic religions. Before the adoption of Dharmism, Buddhism and Islam, the natives of Nusantara archipelago believe in the powerful but unseen spiritual entity that can be either benevolent or malevolent. They also believe that the deceased ancestors are not gone away or disappear completely. The ancestral spirit may gain god-like spiritual power and still involved in their offspring’s worldly affairs. That is why the veneration and reverence to honor ancestor is an important element in the belief system of native ethnic groups, such as Nias, Dayak, Batak, Toraja, Papuan, as well as many other ethnic groups in Nusantara. The etymology of Hyang is alive in modern affairs. Sanghyang and rahyang refer to gods. Dahyang, danyang or dayang refers to the guardian spirits of certain sacred or haunted places. The Javanese word tiyang means “person” is believed to be derived from the words ti and hyang means the descendant of Hyang. Parahyangan or priangan means the abode of the noble Hyangs. Mojang Priangan refers to a girl from Priangan. Dieng Plateau in Central Java is composed from combined words of di–hyang means Hyang’s place in a height. Gunung Padang in West Java is from pada-hyang means the sacred place of Hyangs. The word sembahyang, a synonym with Islamic shalat ritual is originated from combined words sembah–hyang means worshipping the Hyang. Some Javanese people believe that the word wayang, an antiquity theater, was derived from the words ma and hyang means towards the Hyang. Some figures of gods and deities in the wayang story have their noble titles beginning with Sang Hyang. The term Negeri Kahyangan means the Land of Hyangs or the heaven land. Sangeang Api (or Sanghyang Api), an active volcano complex in Nusatenggara Islands, was found in 14th century Majapahit script of Nagarakretagama. Kahyangan (from ka–hyang–an, a place for the Hyangs), in another term is swarga or surga means heaven, is somewhere in the realm that is trusted by the adherents of some beliefs as the abode of the Hyangs. The term Kahyangan is popular in Java, Bali and Lombok in their doctrines of Kejawen, Sunda Wiwitan and Balinese Dharmism as well as in their antiquity story of the wayang. 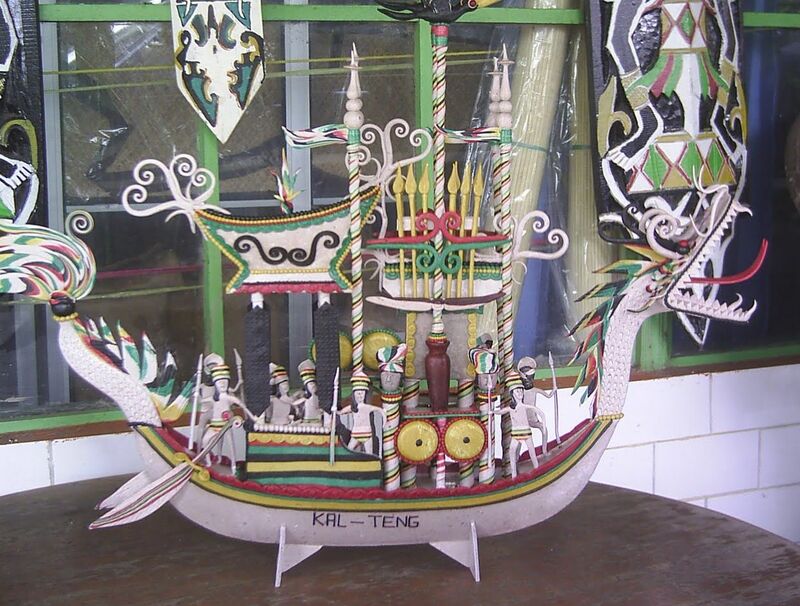 Kahyangan is similar to Banua Ginjang in the Batak and Kaharingan in the Dayak mythologies. In central and eastern Javanese mythology, Hyang is an unseen spiritual entity that has supernatural power associated with gods. Batara Guru is a Hyang that rules Kahyangan (from ka-hyang-an, the realm of the Hyangs). He gives revelations, gifts and abilities. Batara Guru has a consort named Dewi Uma and begat some children. In wayang kulit (the antiquity shadow-puppet), Batara Guru is the only character whose feet face forward, with four hands, pointed canine teeth, a blue neck and paralyzed legs. He always rides Lembu Andini the divine cow, and is also known by several names including Sang Hyang Manikmaya, Sang Hyang Caturbuja, Sang Hyang Otipati, Sang Hyang Jagadnata, Sang Hyang Nilakanta, Sang Hyang Trinetra and Sang Hyang Girinata. Batara Guru has two brothers, Sang Hyang Maha Punggung and Sang Hyang Ismaya. Their parents are Sang Hyang Tunggal and Dewi Rekatawati. Batara Guru is the father of Dewi Sri, the Rice Goddess in native Javanese mythology. For the Sunda Wiwitan beliefs of the Sundanese (western Java), a supreme god named Sang Hyang Kersa created the universe and also other gods such as mother goddess Batari Sunan Ambu and Batara Guru. Batara Guru rules the Kahyangan or swargaloka as the king of gods, while Sang Hyang Kersa remains unseen. According to Sundanese legends, the Parahyangan (from pa–ra–hyang–an, the place for the noble Hyangs) highland, also known as Priangan, was magically created when the Hyangs (gods) are happy and smiling. To fill the land, Sang Hyang Kersa created animals and demons, while the myth of Sang Hyang Sri (also known as Nyai Pohaci Sanghyang Asri) explains the origin of rice and plants on earth as told in Wawacan Sulanjana, an ancient Sundanese manuscript contains the Sundanese mythology. According to the Sundanese legend, the Priangan Plateau was primordially a lake called Danau Hyang (“Hyang Lake”). Balinese Dharmism adherers believe that all the creations of Sang Hyang Widhi Wasa will face the cycle of birth, life and death. The essence of power of Sang Hyang Widhi Wasa is expressed in a set of shrines called Sanggah Pemerajan at outside of every dharmic house. The empty seat (palinggih) at the top of the Padmasana, the main seat, is for Sang Hyang Widhi Wasa.In Balinese Dharmism perspective, the supreme god is known as Sang Hyang Widhi Wasa (also known as Acintya or Sang Hyang Tunggal), which means the Almighty God. Sang Hyang Widhi Wasa is associated with the concept of Brahman, that their religion had a single god, though there are various manifestations. Three well known manifestations of Sang Hyang Widhi Wasa, namely Brahma, Wisnu and Siwa, which are named as Tri Murti; Brahma is the creator (utpatti), Wisnu is the caretaker (sthiti) and Siwa is the destroyer (praline). Other noted manifestation is Dewi Sri, the goddess of rice. In Kaharingan, a folk religion professed by many Dayaks in Kalimantan, their supreme God is called Ranying Hatalla Langit, their ancestral spirits (divine man) Sangiang, their ancient language Sangen and their ancestors Tato-hiang. In addition, Kaharingan has ritual offerings called Tiwah, place of worshipping called Balai Basarah or Balai Kaharingan and holy books called Panaturan, Talatah Basarah (group of prayers) and Tawar (a guide to seek God’s help by giving rice). The main festival of Kaharingan is the Tiwah festival, which lasts for thirty days, and involves the sacrifice of many animals like buffalos, cows, pigs, and chickens as offerings to the Supreme God. 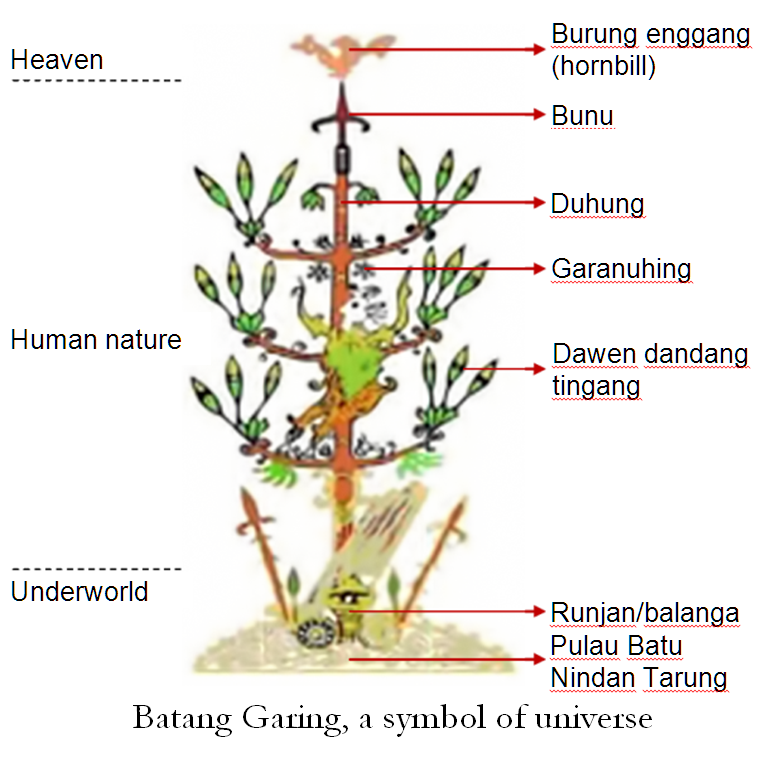 In their religion, the universe is divided into three divisions of life: underworld, human nature and heaven, as symbolized in a tree called Batang Garing. Among the many tribes of Dayaks in Kalimantan, those living in the upper reaches of the rivers in the province of Central Kalimantan are the Dayak Ngaju, the Lawangan, the Ma’anyan and the Ot Danum, known as the Barito Dayaks, named after the large Barito river. Among these, the most dominant are the Ngaju, who inhabit the Kahayan river basin by the present city of Palangkaraya. In practice the Ngaju focus on the supernatural world of spirits, including ancestral spirits. The Kaharingan religion is correlated to the Hyang concept. The names Ranying, Sangiang, Sangen, Tato-hiang and Kahayan are phonetically in close resemblance to and derived from the words “hyang”, “ra-hyang”, “sang-hyang” and “ka-hyang-an”. The Buginese (southern Sulawesi) developed an extraordinary creation myth called Galigo. According to Sure’ Galigo (an epic of creation myth of the Bugis), Datu Patoto’ is the supreme god; with his wife Datu Palinge’ begat Batara Guru who was sent to earth to cultivate it as human being. His divine name was La Toge’ Langi’. He had at least ten children from his five concubines, but only one son from his beloved consort, We Nyili’ Timo’. He is the father of Batara Lattu’ and grand father of Sawerigading, the main characters in the Buginese Sure’ Galigo. He is also the father of Sangiang Serri, the goddess of rice and fertility in Buginese mythology. However, mankind does not descend from them but from their servants and the servants of other divine rulers. The present of Batara Guru and Sangiang Serri in the Buginese mythology at least shows its correlation to the Hyang concept. In the Torajan (central Sulawesi) mythology, their ancestors came down from heaven using stairs, which were then used by the Torajans as a communication medium with Puang Matua, the creator and supreme god. The cosmos, according to aluk (the way), is divided into the upper world (heaven), the world of man (earth), and the underworld. At first, heaven and earth were married, and then there was darkness, a separation, and finally the light. Animals live in the underworld, which is represented by rectangular space enclosed by pillars, the earth is for mankind, and the heaven world is located above, covered with a saddle-shaped roof. Other Torajan gods include Pong Banggai di Rante (god of Earth), Indo’ Ongon-Ongon (a goddess who can cause earthquakes), Pong Lalondong (god of death), and Indo’ Belo Tumbang (goddess of medicine); and there are many more. In Batak (northern Sumatera) mythology, the universe is divided into three worlds, namely the upper world called Banua Ginjang, the middle world called Banua Tonga and the underworld called Banua Toru. The middle world, where humans live, is also an intermediary between the upper world and the underworld. The upper world is the abode of the gods, while the underworld is the abode of demons and spirits of the earth and fertility. Colors commonly used by the Batak people for household appliances, Hauduk, Ulos cloth and wood carvings are white, red and black are symbols of the three-world. The creator of the world in the Batak mythology is Mulajadi na Bolon, assisted by a series of other deities which are divided into seven levels in the upper world. Mulajadi na Bolon has three children namely Debata Guru, Debata Soripada and Debata Mangala Bulan; they are known as Debata Sitolu Sada (three gods in one) or Debata na Tolu (three gods). The three gods are under the control of the supreme god Mulajadi na Bolon. It was told that Mulajadi na Bolon sent his daughter Tapionda to earth at the foot of Pusuk Buhit mountain. Tapionda later became the mother of the first king of Batak. Other noted gods are Debata Idup (the god of life) and Pane na Bolon who rules the middle world. Many other gods are associated with the dharmic gods; among others are Boraspati ni Nato and Boru Saniang Naga. In addition, there are spirits that abode lakes, rivers and mountains. 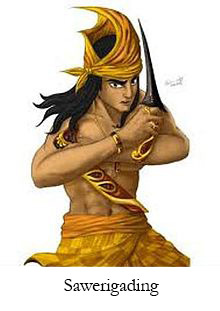 The term debata is identical to dewata or hyang and there is single supreme god so that the Batak mythology is correlated to the Hyang concept. The present of Debata Guru in the Batak mythology at least shows its correlation to the concept. Rejangese is one of the oldest ethnic groups in Sumatera living mainly on the southwest coast of the island, on the cool-weather slopes of the Barisan mountain range, in the province of Bengkulu, Indonesia. Most of the Rejangese inhabit the regions of Rejang Lebong, Kepahiang, Central Bengkulu, North Bengkulu and Lebong Regencies. Megalithic sites are ubiquitous in this area influenced by the Basemah culture in southwestern Sumatera. The Rejangese called them Hejang. Rejangese language is not obviously close to other Malayo-Polynesian languages. Rejangese have their script, known as the Rejang Kaganga alphabet, somewhat similar to Phoenician alphabet. There is no connection to the Dayak Rejang inhabiting eastern and northern Kalimantan. In their culture, rituals are performed on the occasion of the opening of forest land for slash-and-burn farming (a ritual called kedurai agung) and during the rest of the cycle of rice cultivation. The most important ritual, kedurai mundang biniak, is performed just before the sowing of rice. On this occasion the rice goddess, Nyang Serai, leave the rice and the village and goes to heaven in order to take care of the rainfall. The festivities include a dance performed every evening by seven boys and seven girls from different clans as an expression of clan exogamy. Mundang biniak is held over seven days, and use to be performed only once every three to seven years. In other years seed is blessed by a smaller ritual, membasuh biniak. The ritual cycle ends at the harvest, when Nyang Serai returns to the village and ensures that the rice spirit will not leave the rice being stored in the barns. The Rejang culture is correlated to the Hyang concept that in the rituals they worshipping the rice goddess, Nyang Serai, identical to Sanghyang Sri, Sangiang Serri and Dewi Sri in other cultures. Some people believe that Rejang is derived from the words ra and hyang, meaning the noble Hyang. A region named Kepahiang as well as Hiang (in the neighboring Kerinci region) having the same pre-historic age also can be correlated. Nias is an island off the western coast of Sumatera. In their mythology, the universe is made of three superposed worlds. The upper world, Tetehöli Ana’a, is the model, the place of origin of the gods, in the sky, in the clouds and long ago near the earth. That world has several villages with different people who are often opposed to each other. Lowalangi is the god of this upper world. Silewe Nazarata, his sister and/or wife, gave knowledge to humans: she taught them how to cultivate fields, build houses and carve statues. The underworld is dark, sometimes identified with a cave or a large hole peopled with evil spirits. From it come earthquakes. It is the home of Lature Danö, the elder brother of Lowalangi. The middle world, or world of humans, was created by the gods or in certain versions by one of them by means of their skin scales.